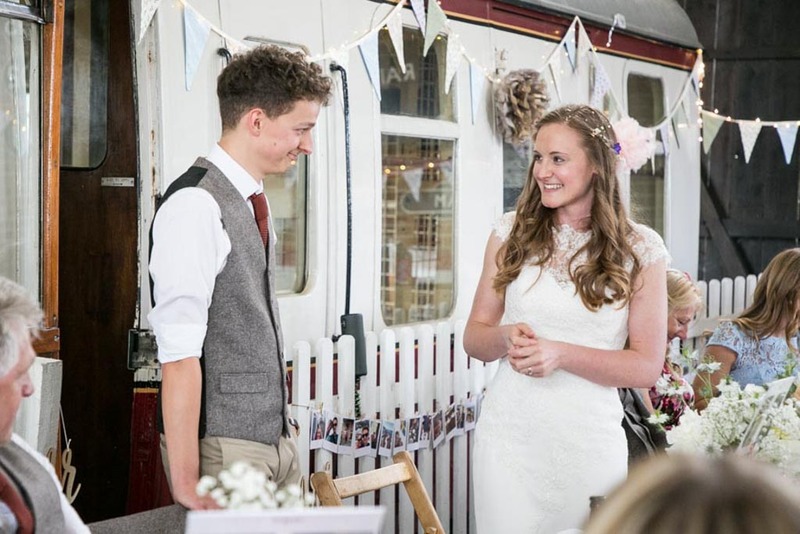 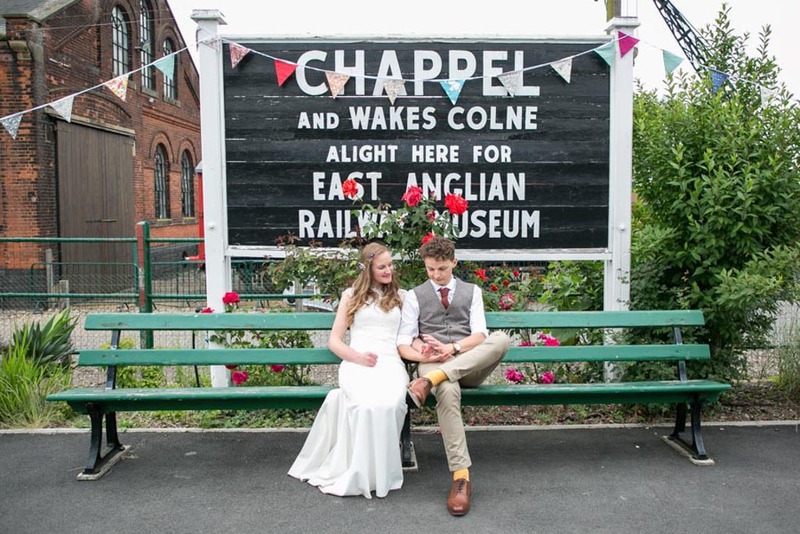 Today I am thrilled to share this gorgeous Vintage Tea party Wedding at the East Anglian Railway Museum with pastel details. 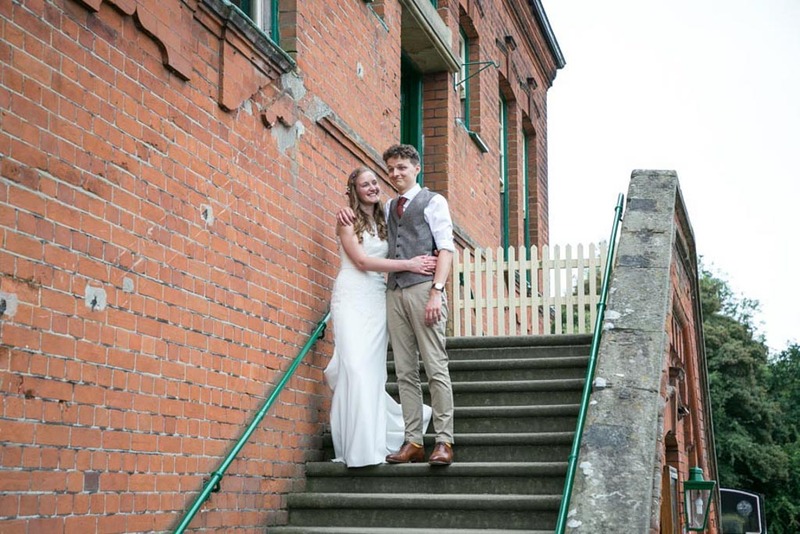 Images were captured by Rebecca Prigmore Photography. 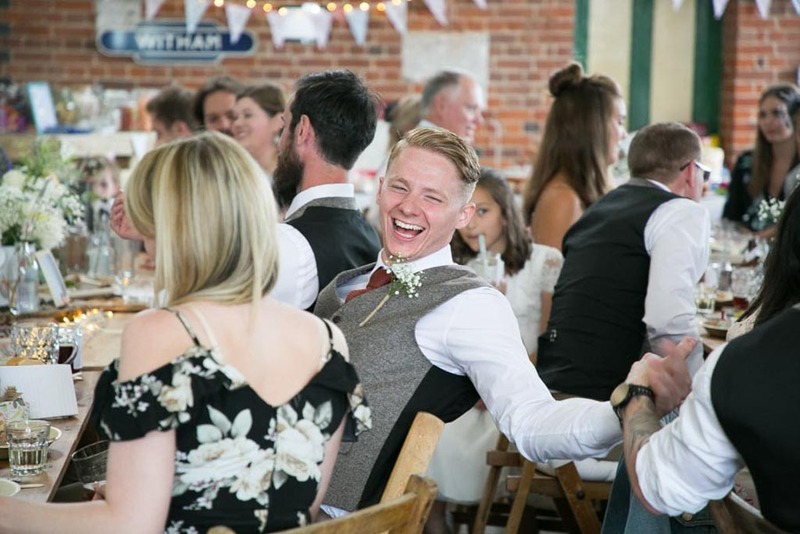 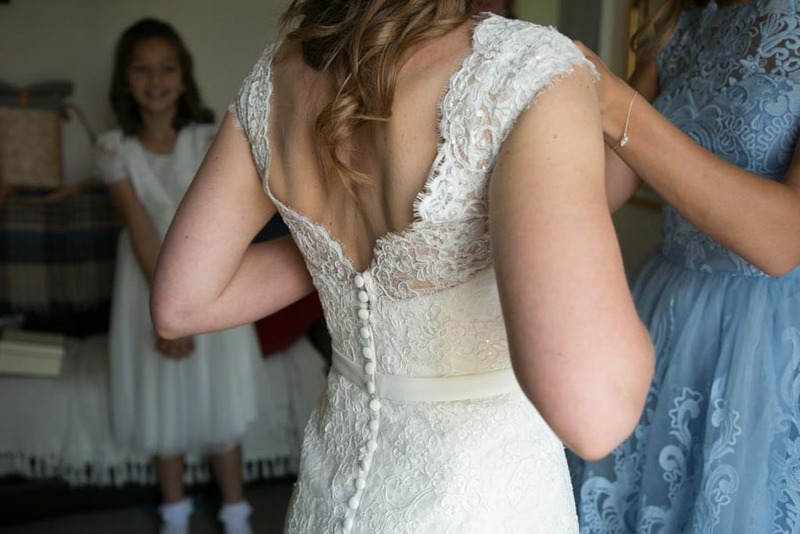 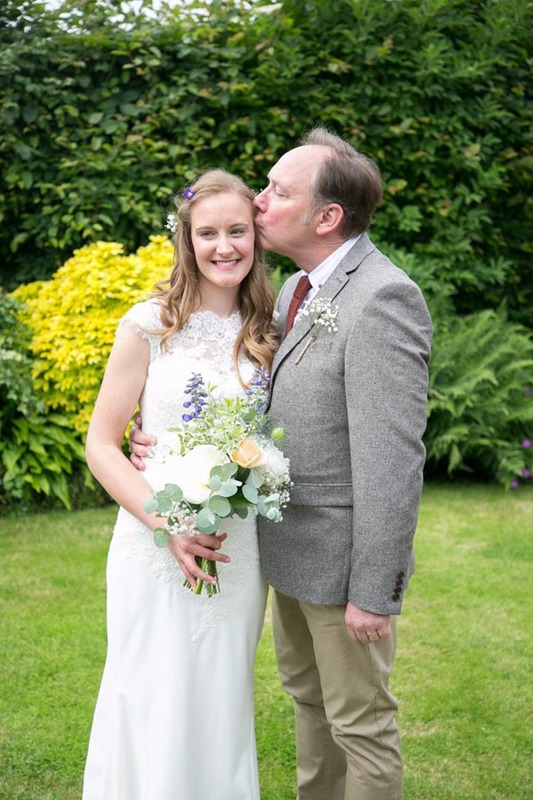 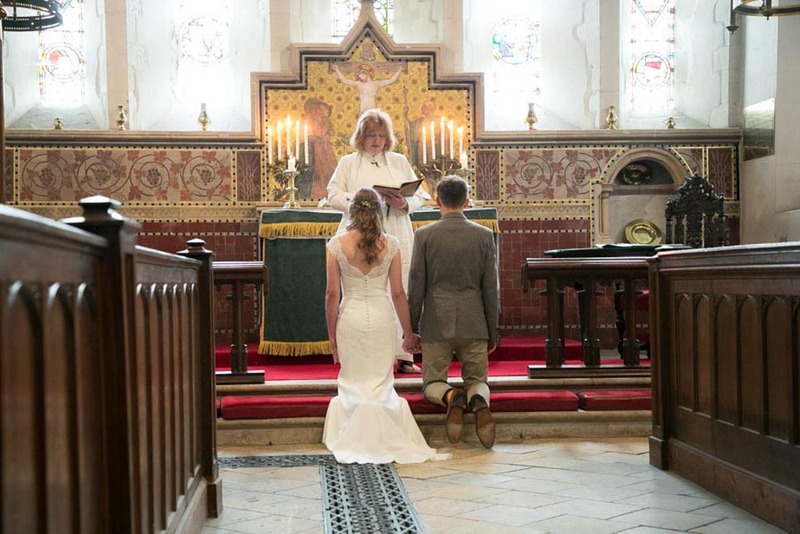 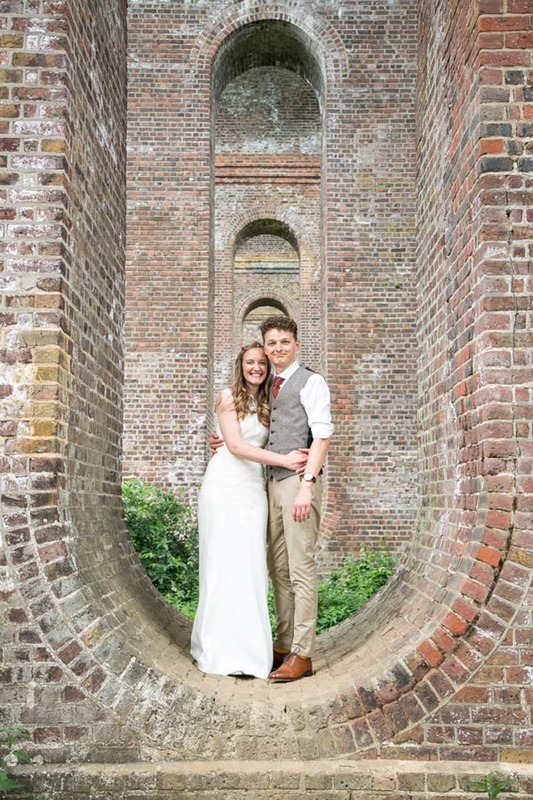 Rebecca is a fun, natural, quirky, alternative wedding & portrait photographer, based near Cambridge, Saffron Walden & Bury St Edmunds, and working throughout the UK. 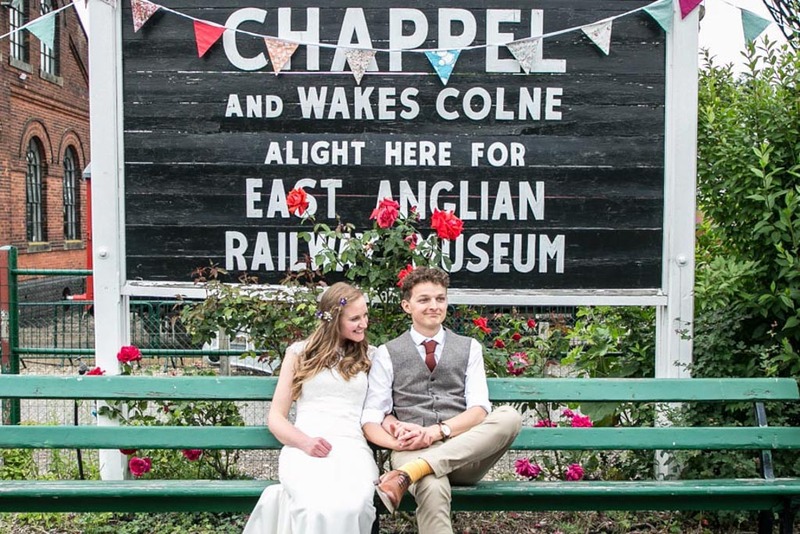 I was delighted to capture this amazing, relaxed vintage wedding at the wonderful East Anglian Railway Museum this summer. 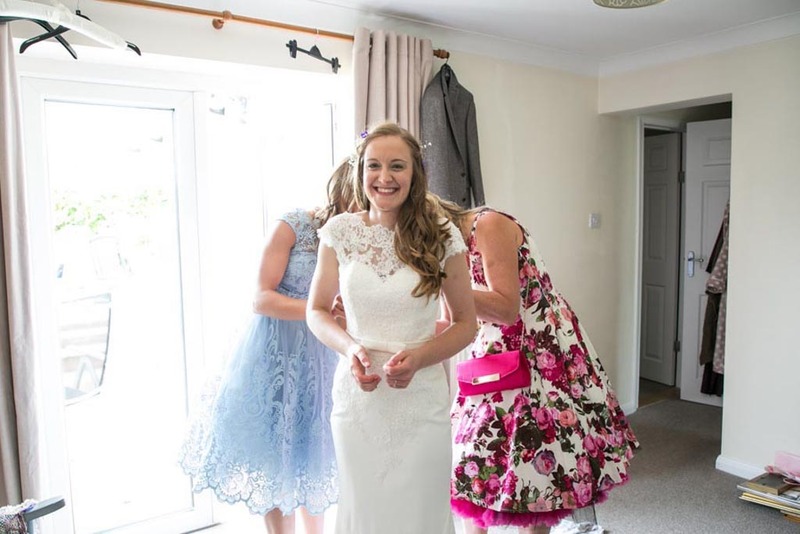 Bec’s got ready at her parents lovely Essex village home, before walking down the road to the beautiful church. 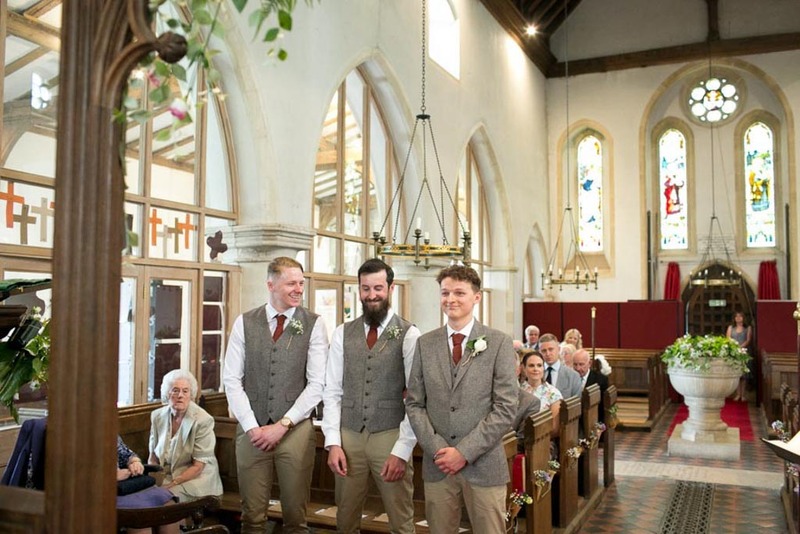 During the getting ready photographs, I’d been able to pop down to the church to see Nick and the grooms men getting everything ready and guests arriving too. 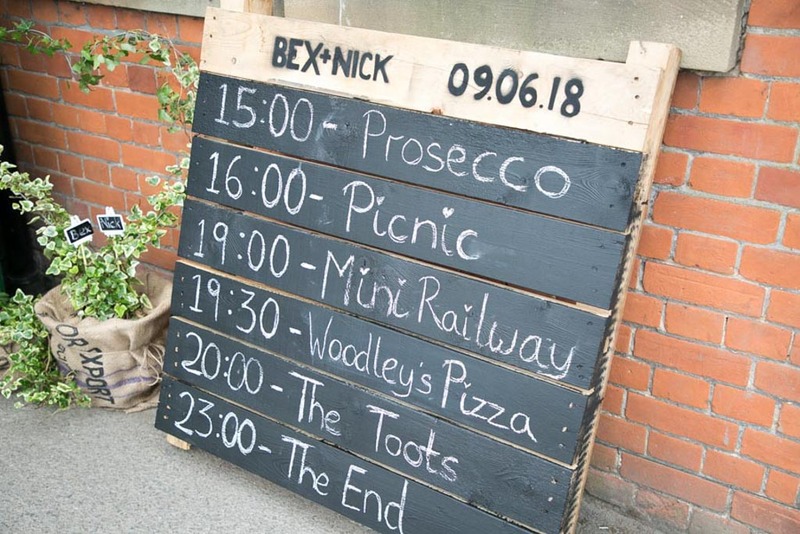 Nick and Bec’s were so excited for their big day, they positively fizzed with excitement! 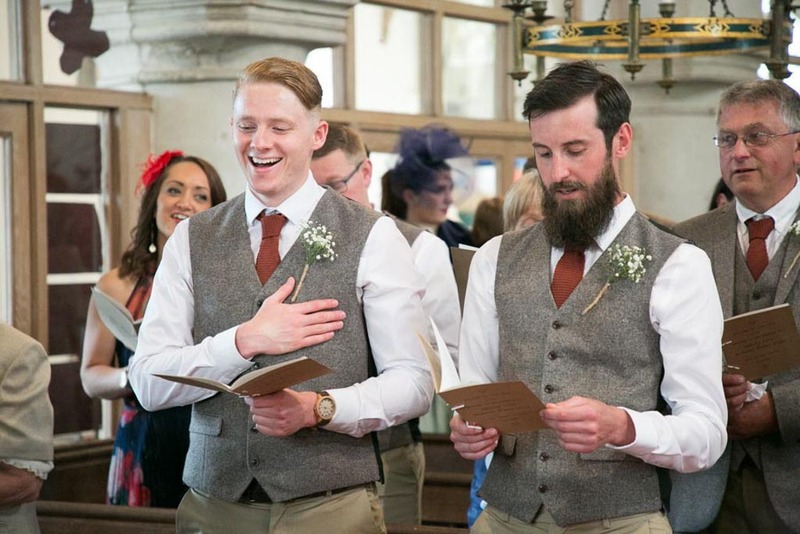 The wonderful emotional ceremony was everything they had dreamed of, and as ever a tear may have come to my eye! 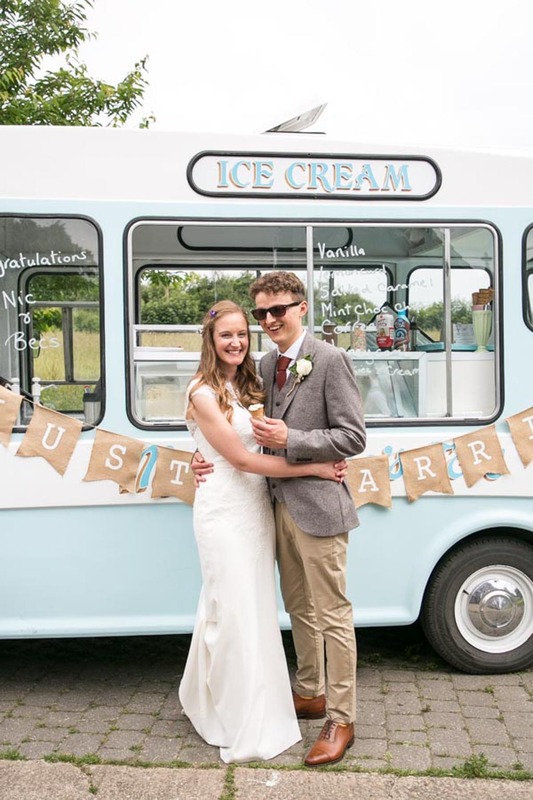 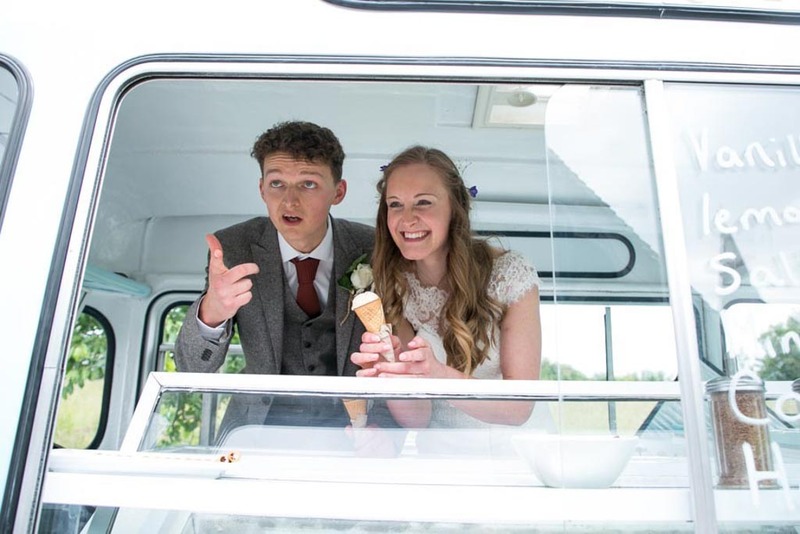 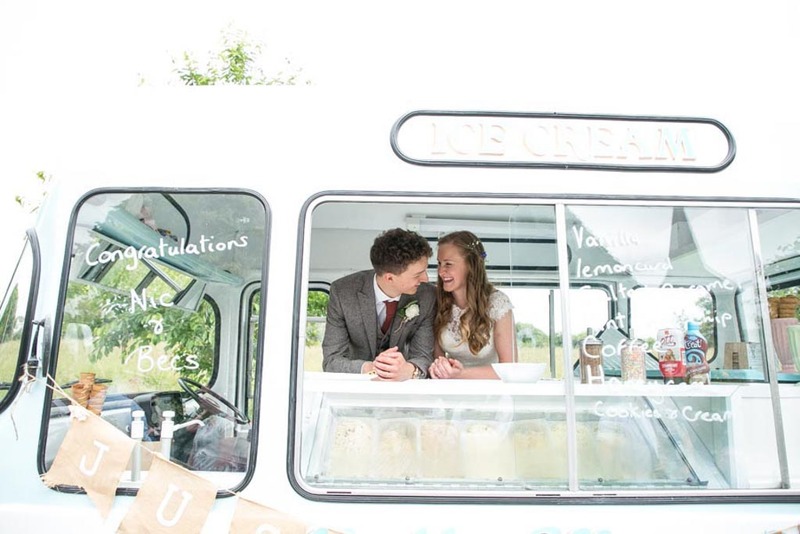 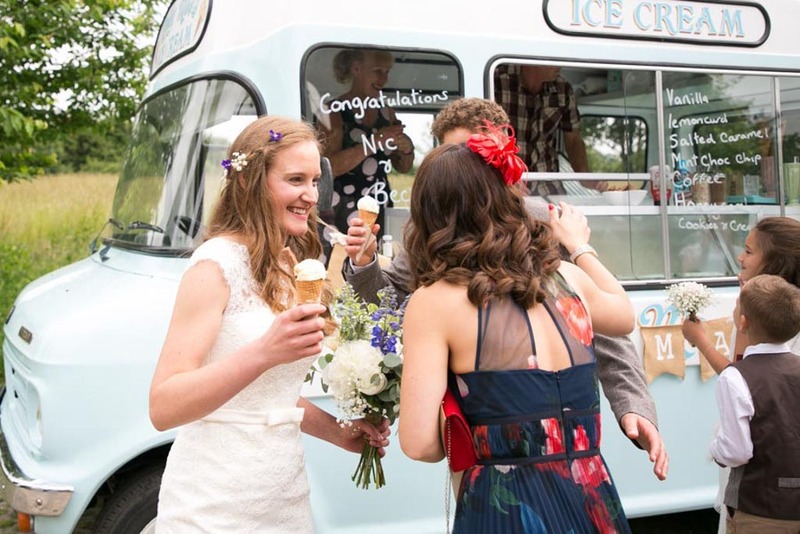 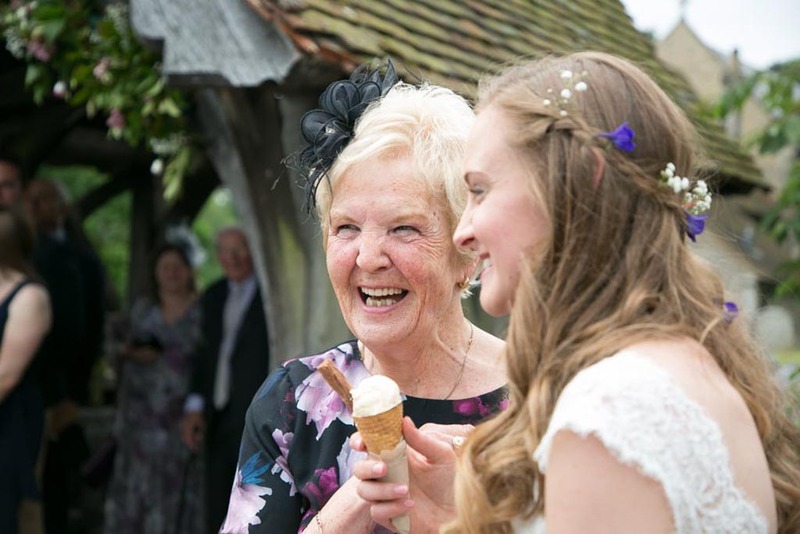 After the ceremony, the guests were immediately treated to delicious ice creams from an amazing vintage Ice cream van, Molly Moo’s Ices. 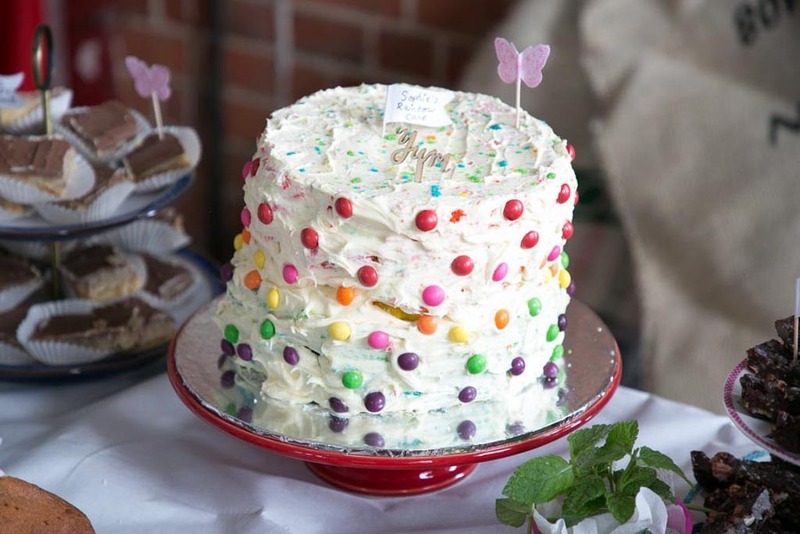 What a way to start the celebrations! 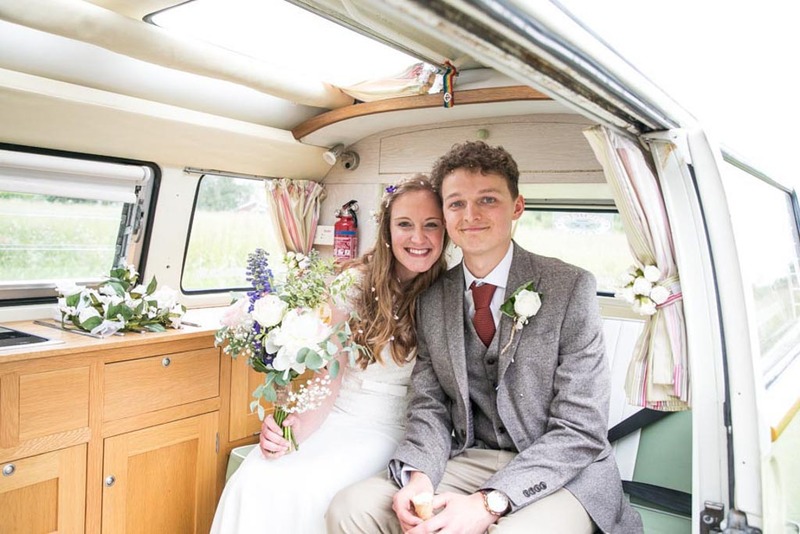 After some relaxed group photos, the bride and groom were showered in confetti as they made their way to their wedding transport, a fab VW Campervan. 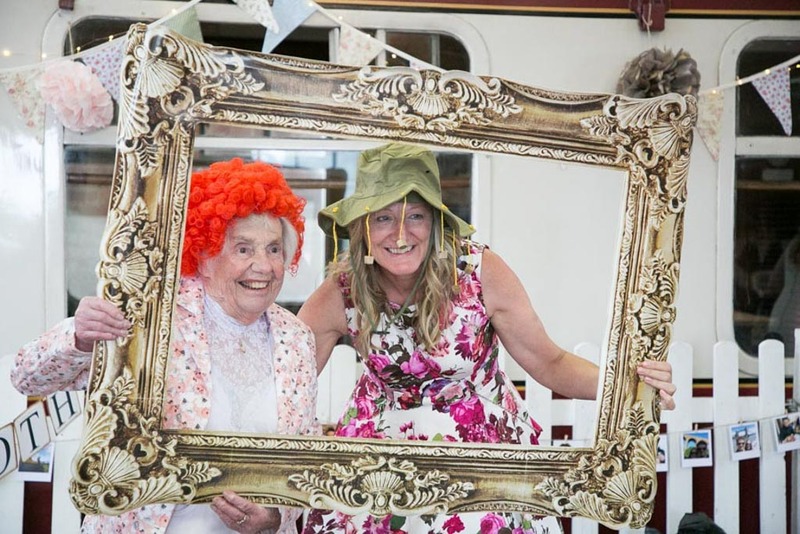 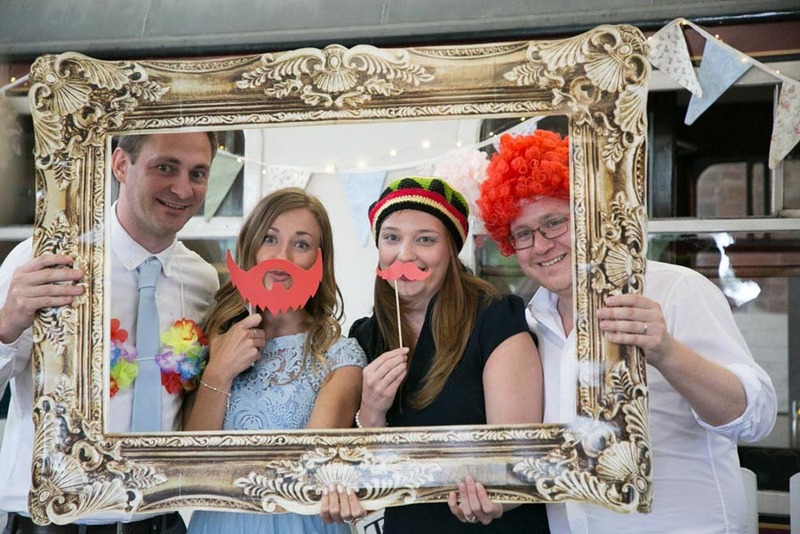 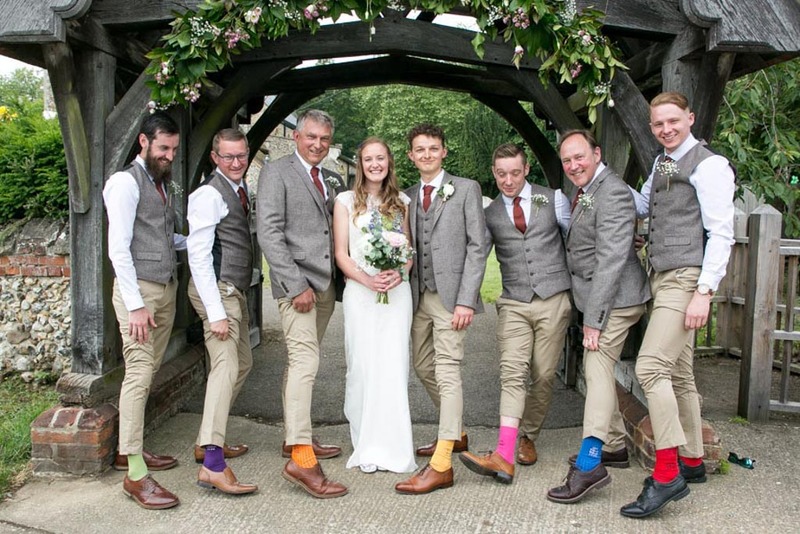 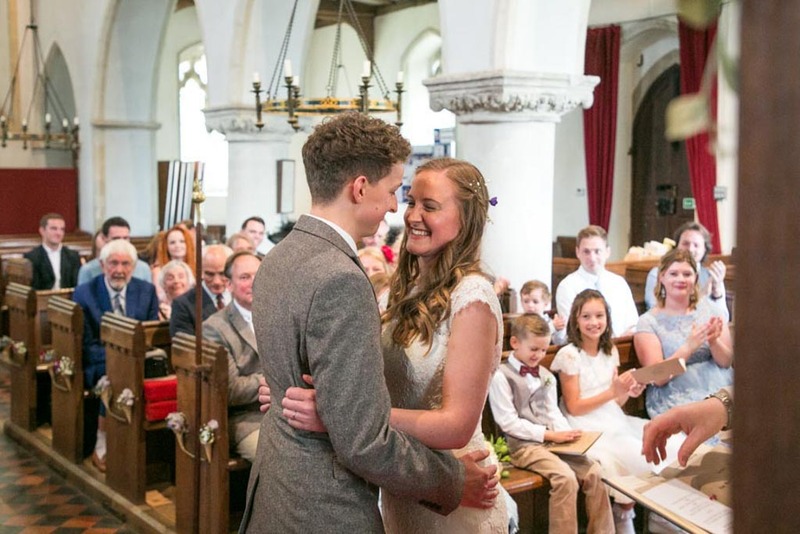 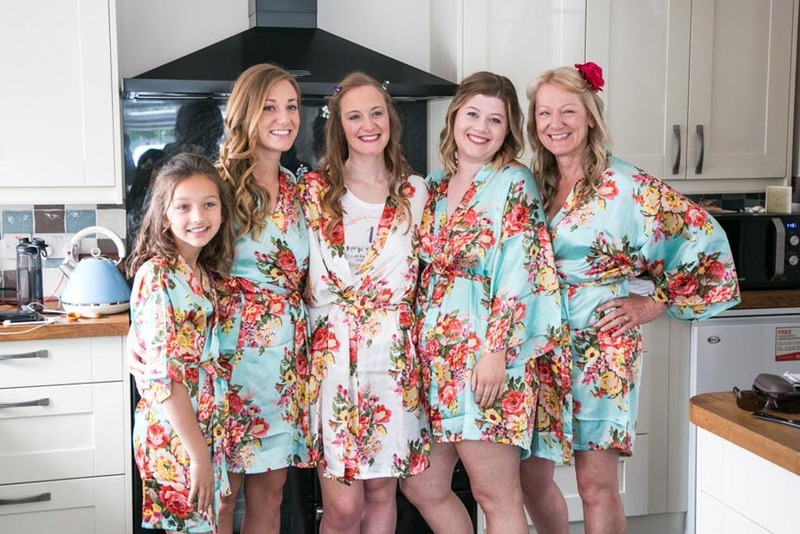 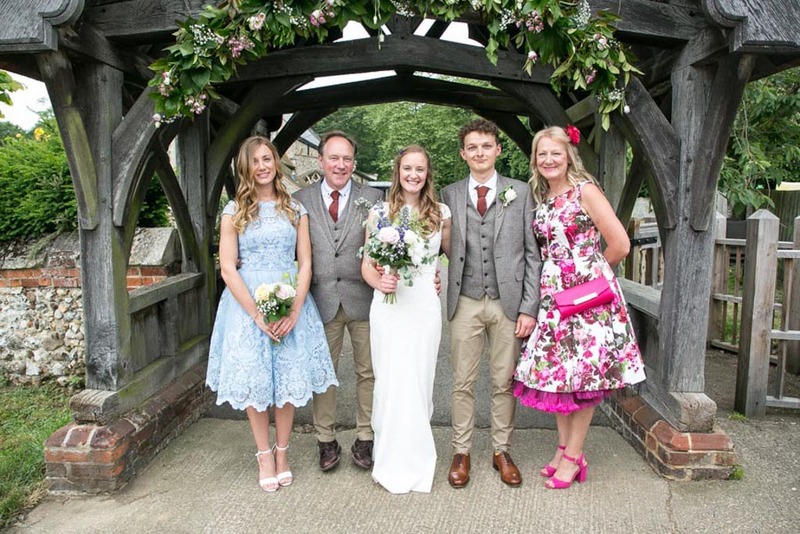 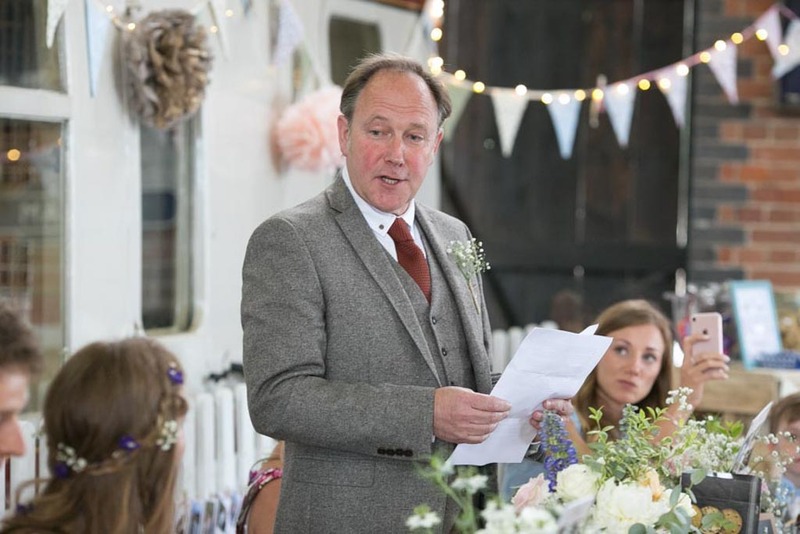 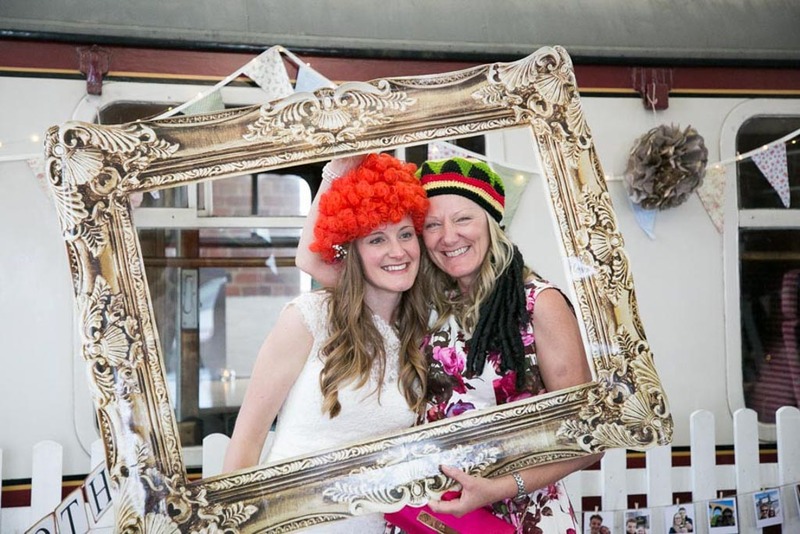 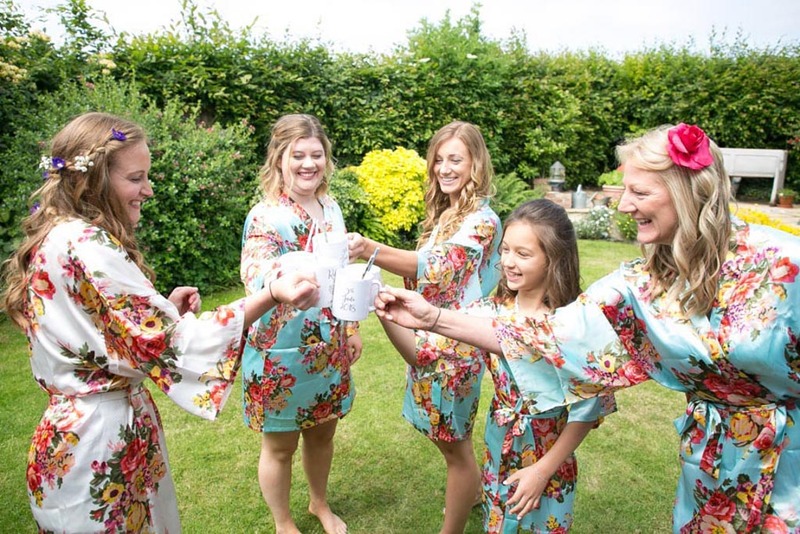 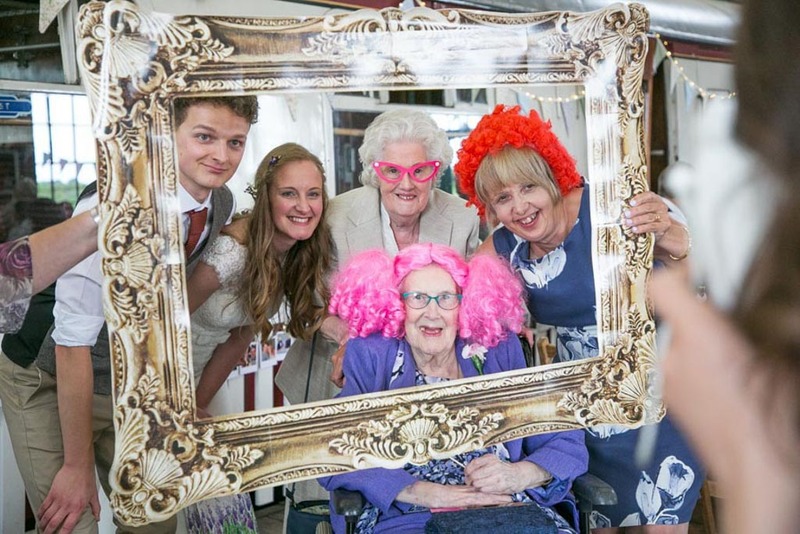 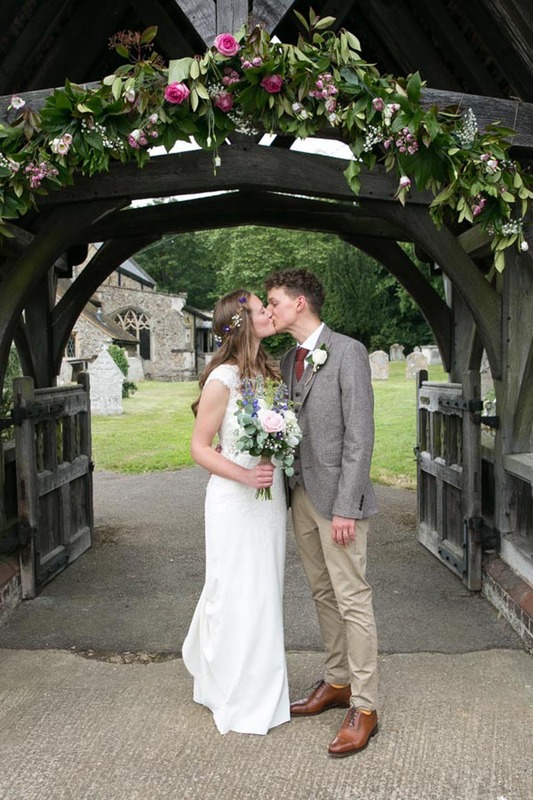 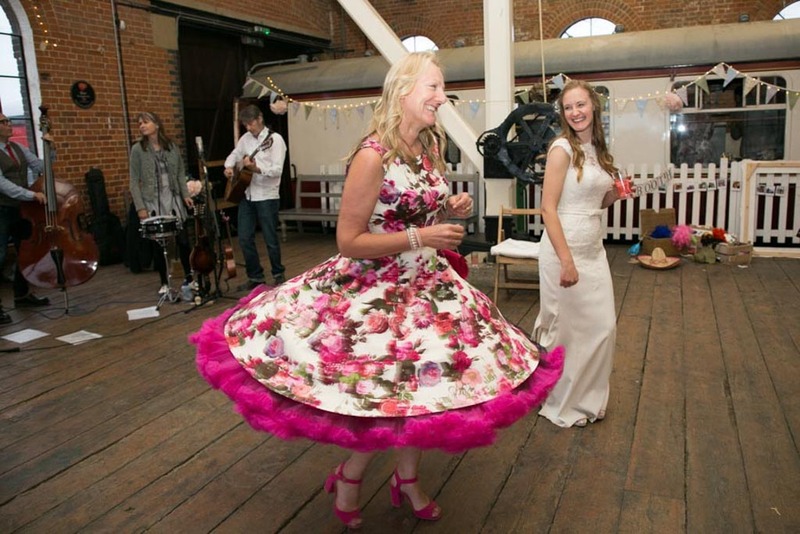 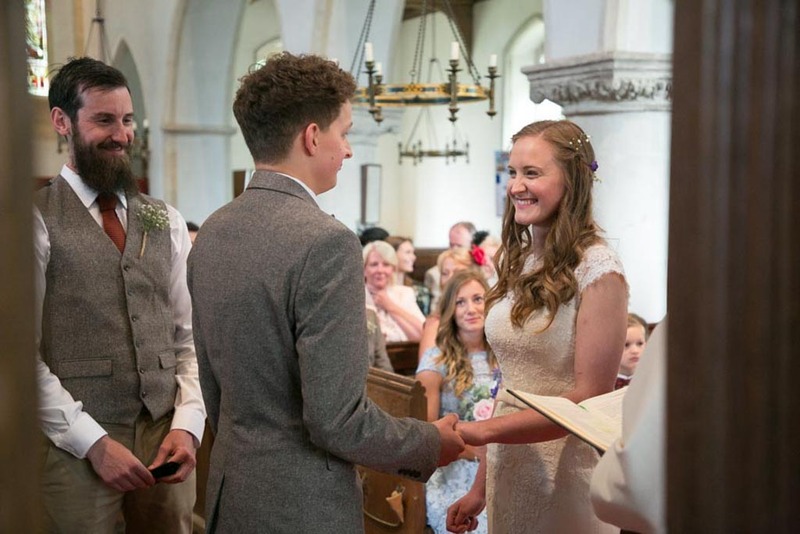 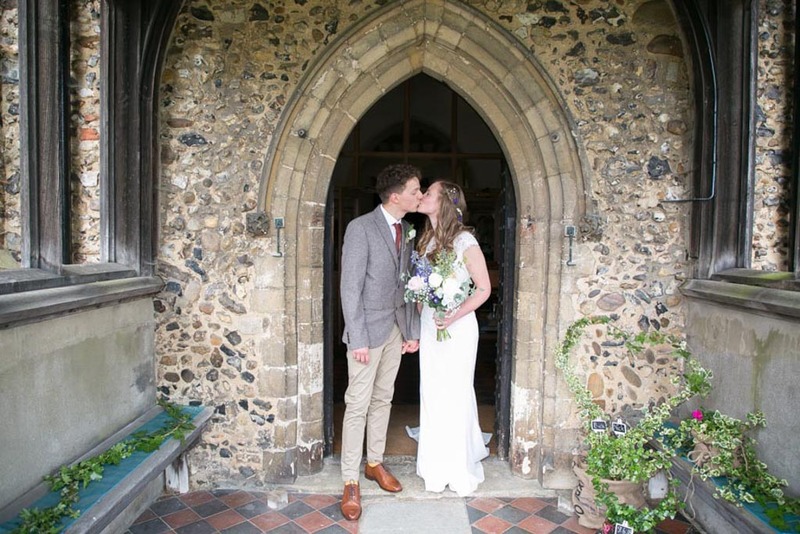 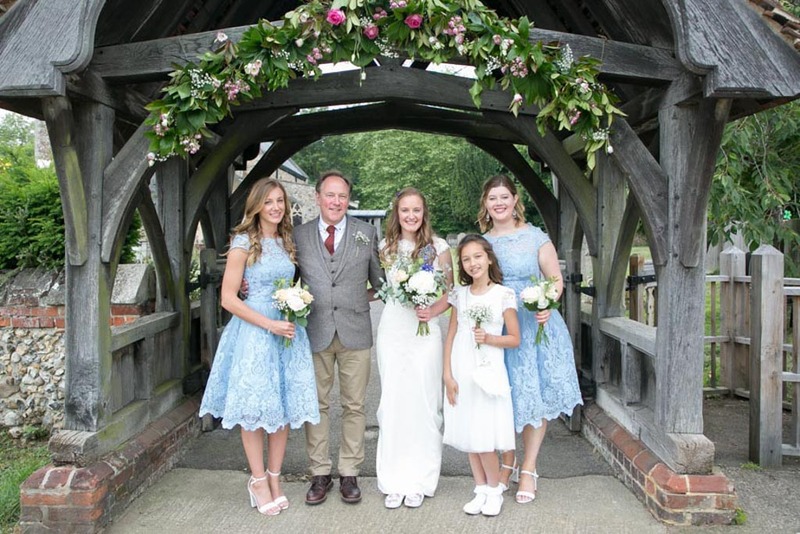 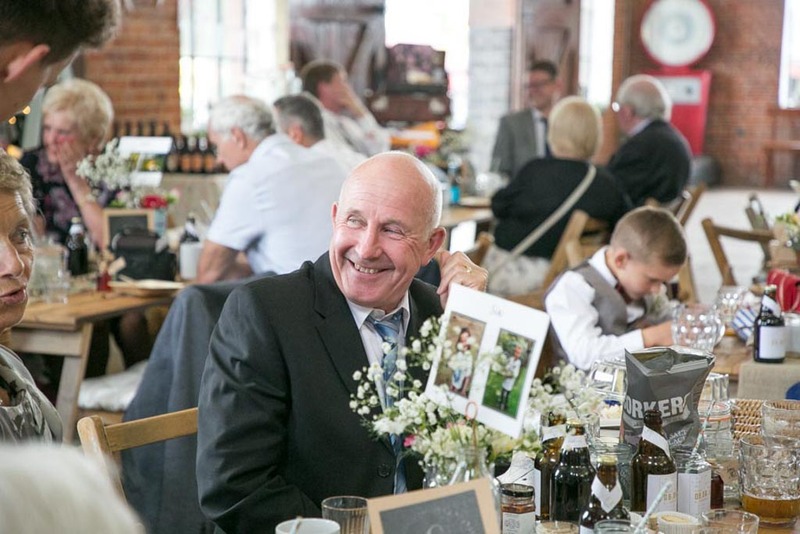 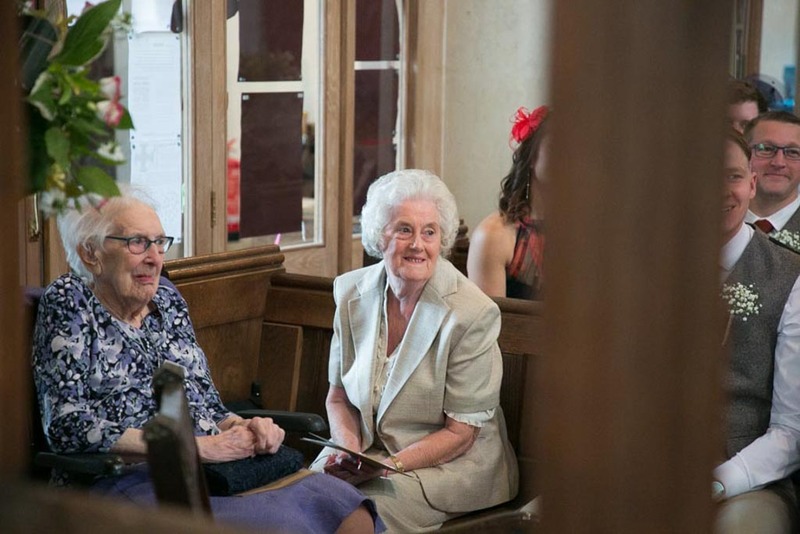 The vintage theme at this fabulous Essex wedding was strong! 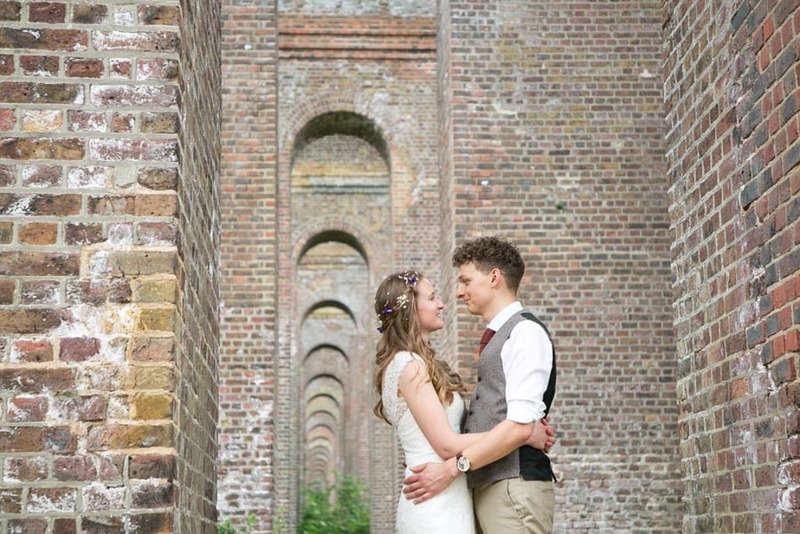 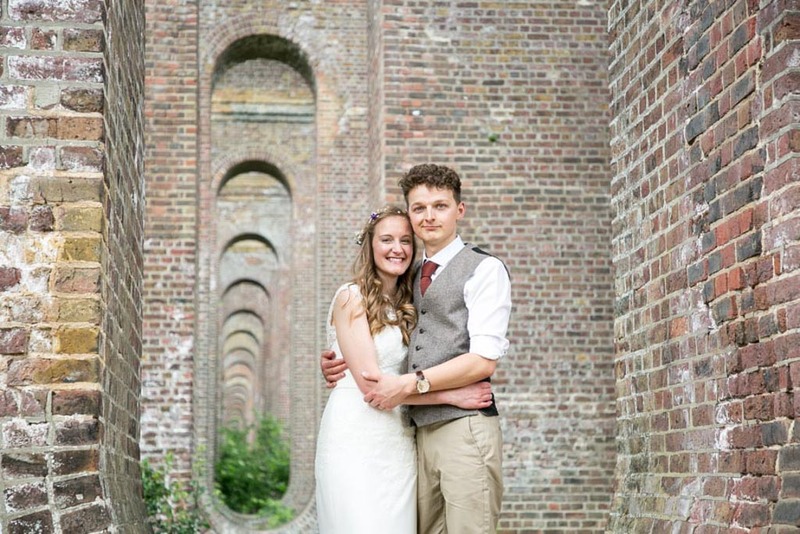 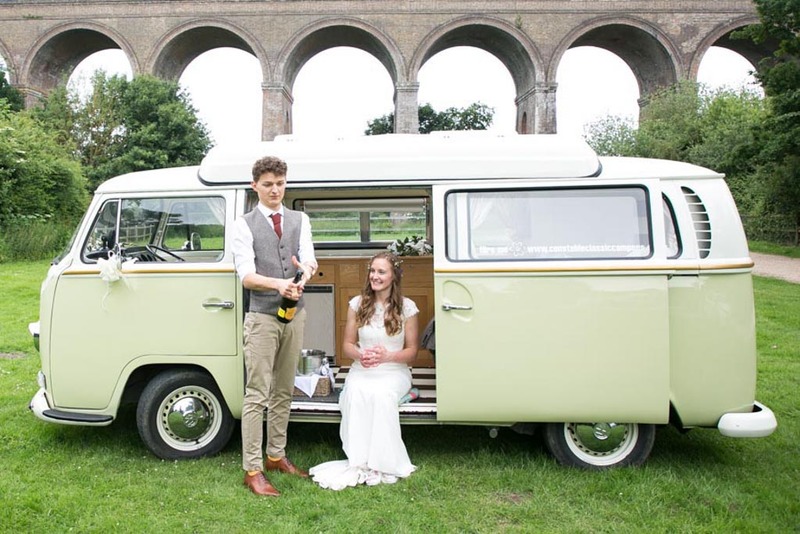 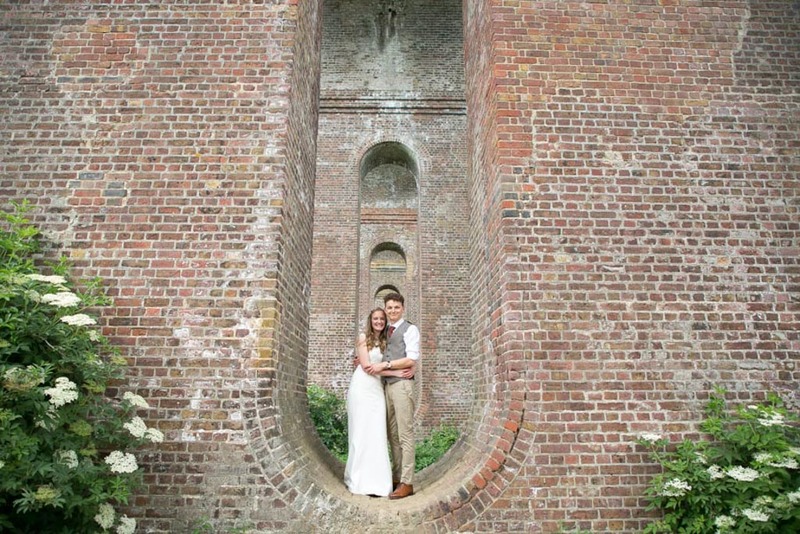 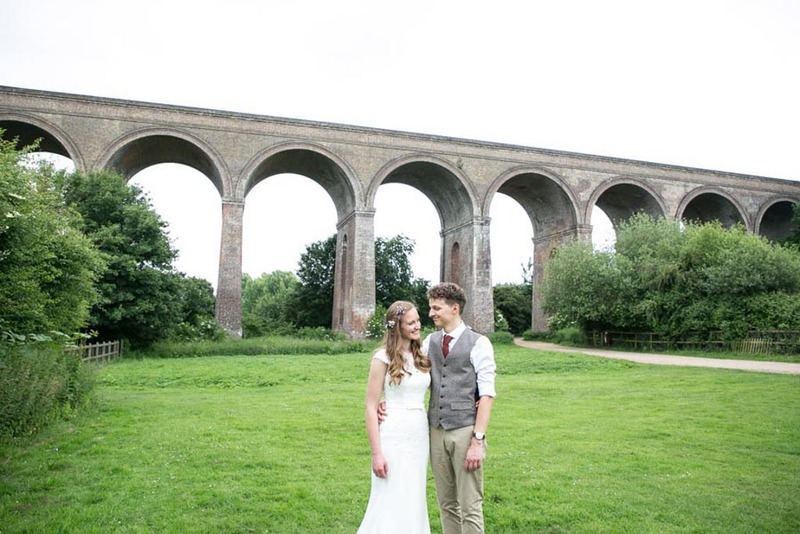 One of the great things about the East Anglian Railway Museum is it’s close proximity to Chappel Viaduct.. Not only are their the delights of the whole railway museum in which to photograph the couple, the viaduct is a stunning location creating an amazing backdrop for wedding photos. 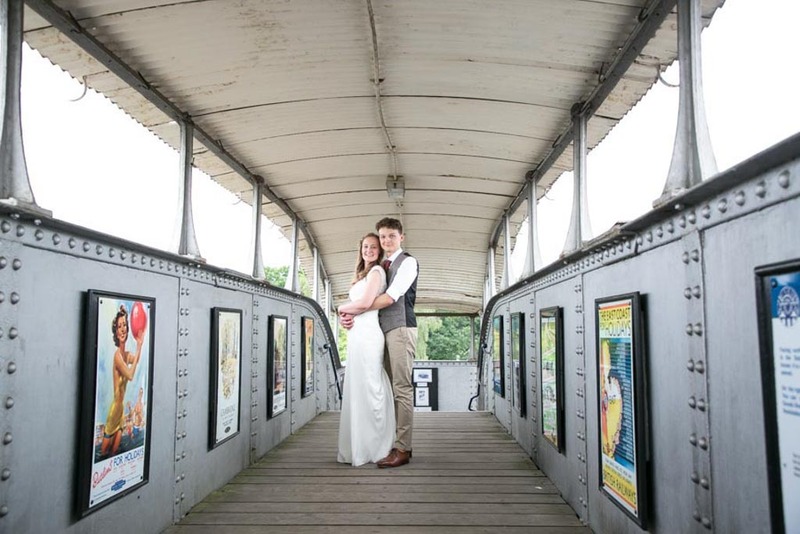 These guys were such good sports, dodging the drips and dog walkers to climb up onto the viaduct. 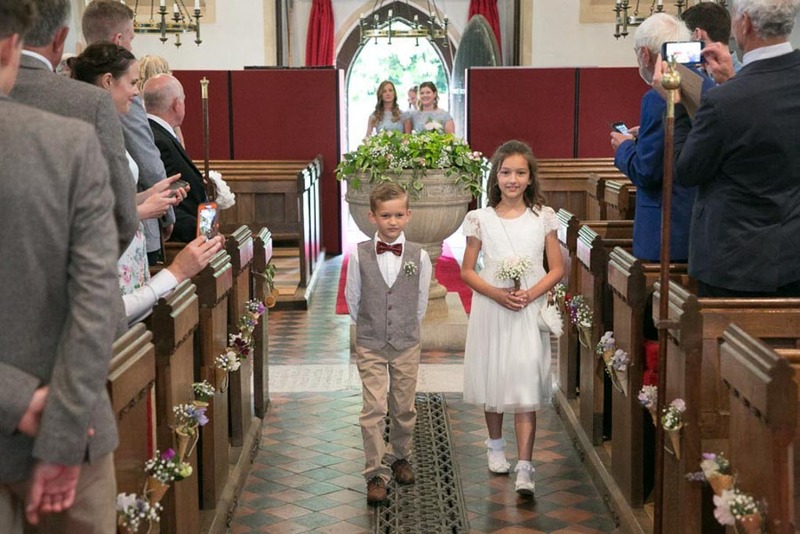 The result was worth is and I think for them just that little bit of time alone was pretty special too! 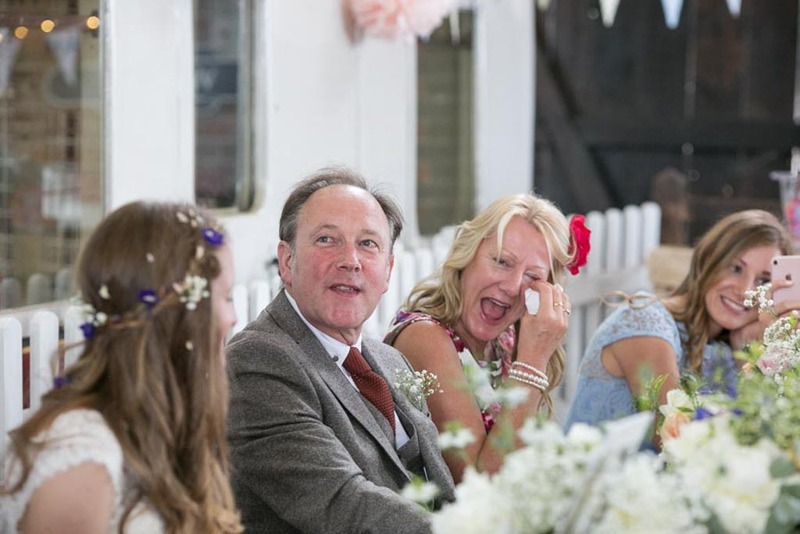 And so back to the wonderful wedding reception. 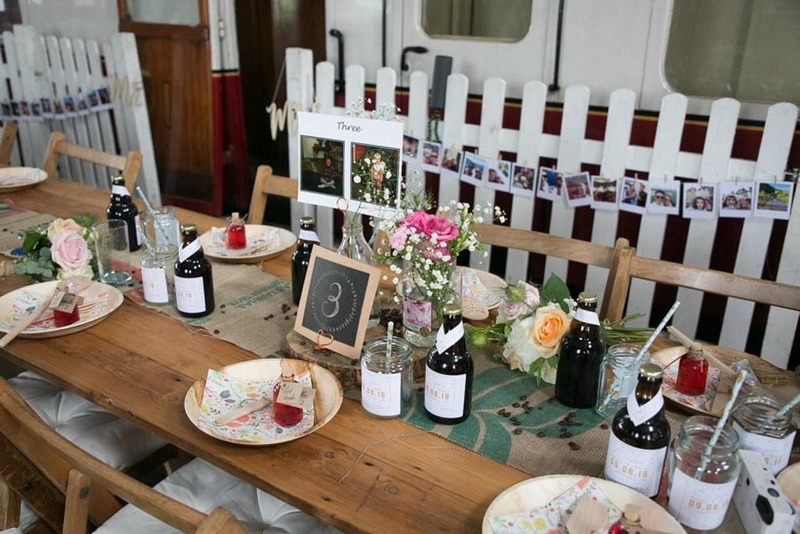 Guests had drinks on the platform while the bride and groom headed back from the viaduct. 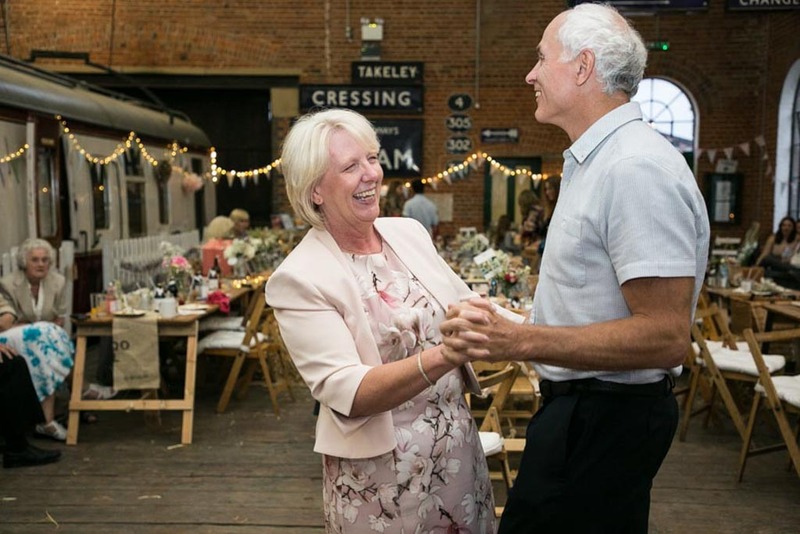 After mingling and chatting, we all headed into the amazing railway shed where long trestle tables were set up in a rustic, vintage style. 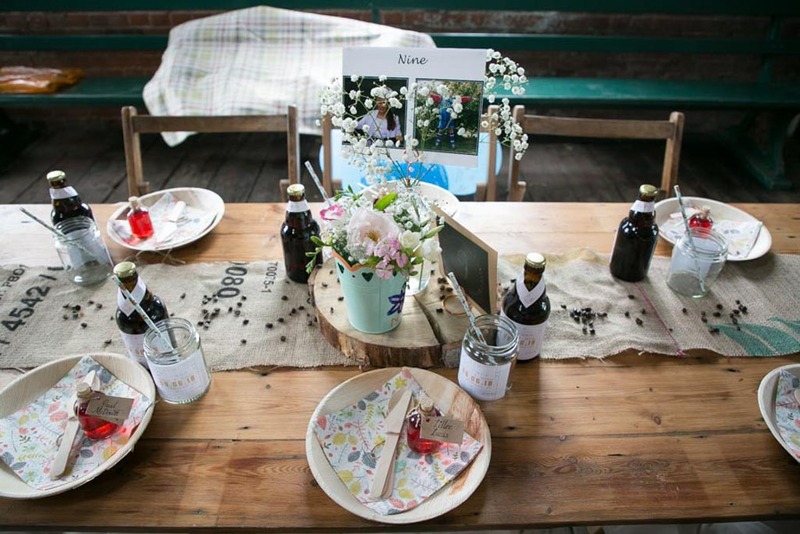 They had picnic hampers for a fab picnic style wedding breakfast, rustic flowers in jars and watering cans and individual jam jars and beers for each guest. 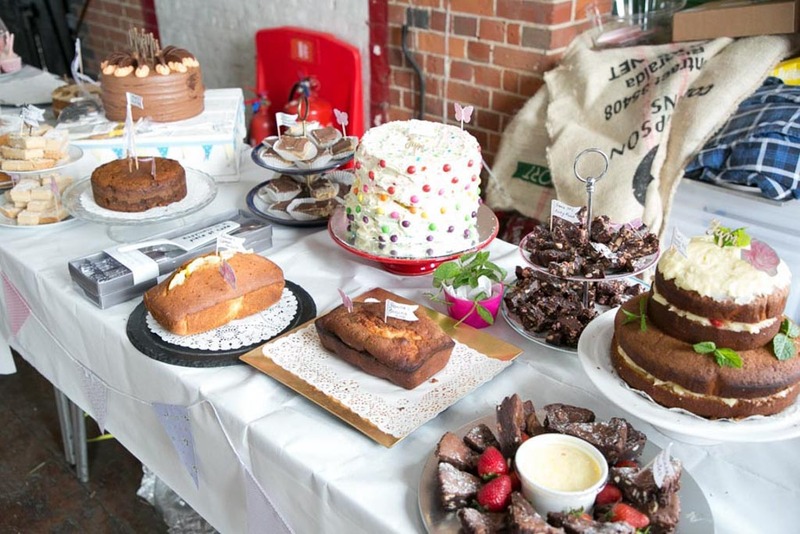 The wedding cake was an amazing table full of cakes of all shapes and sizes that guests have baked and brought along. 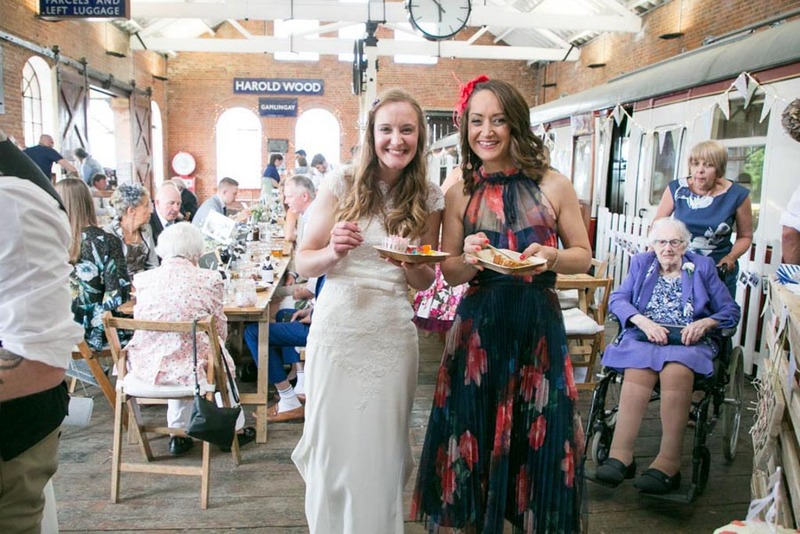 The non-traditional couple didn’t do a cake cutting a such, just after the food they led the way by helping themselves to delicious cake. 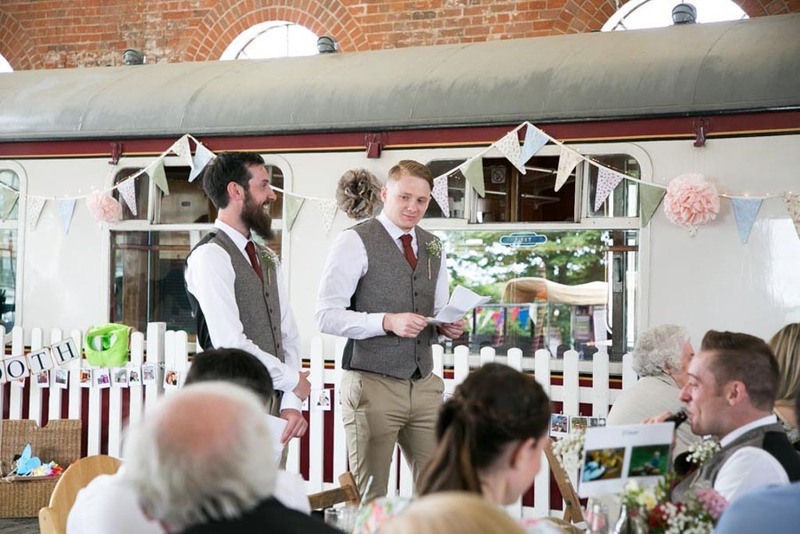 All other guest soon followed suit. 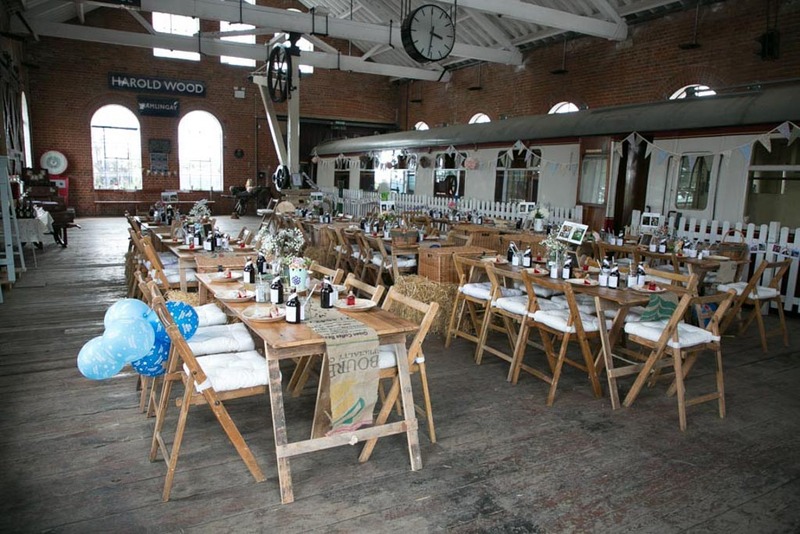 Fun and emotional speeches topped off the meal time, which then led to drinks and relaxing at this amazing venue. 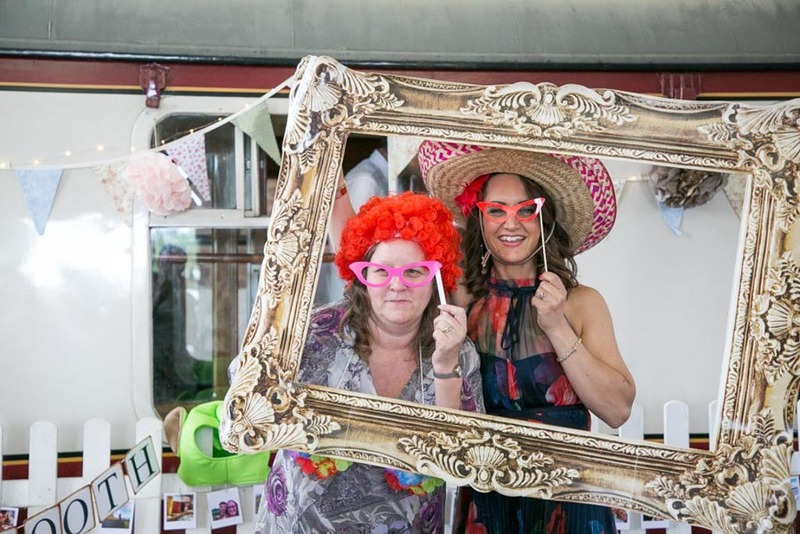 Guest chatted, laughed, ate cake and had drink from the amazing horse box bar. 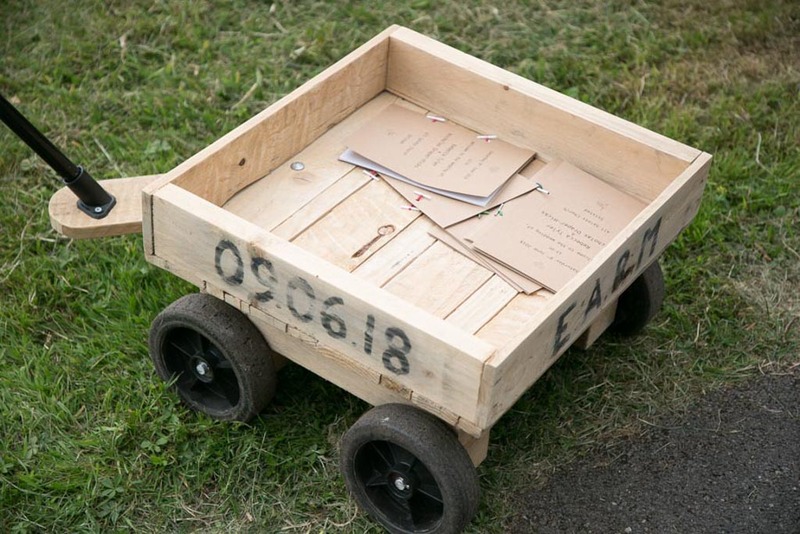 A little later pizza was served from another mobile food van, soaking up any extra booze! 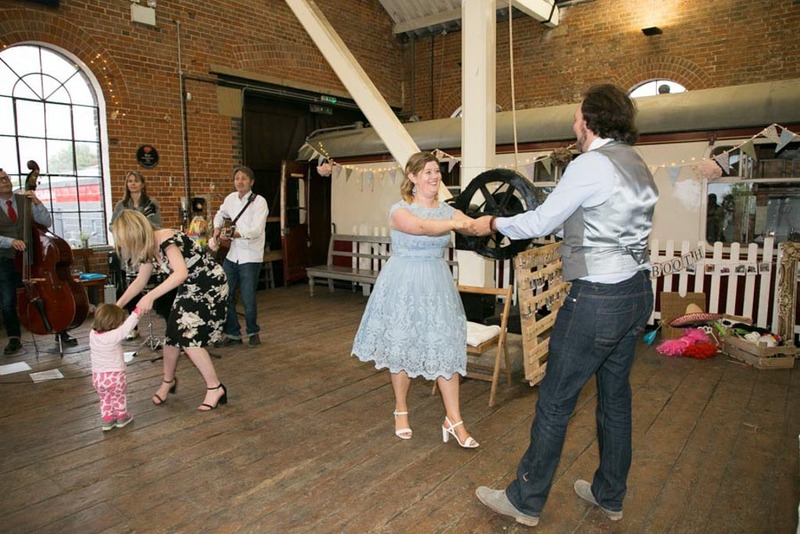 The wonderful skiffle band played to entertain the guests. 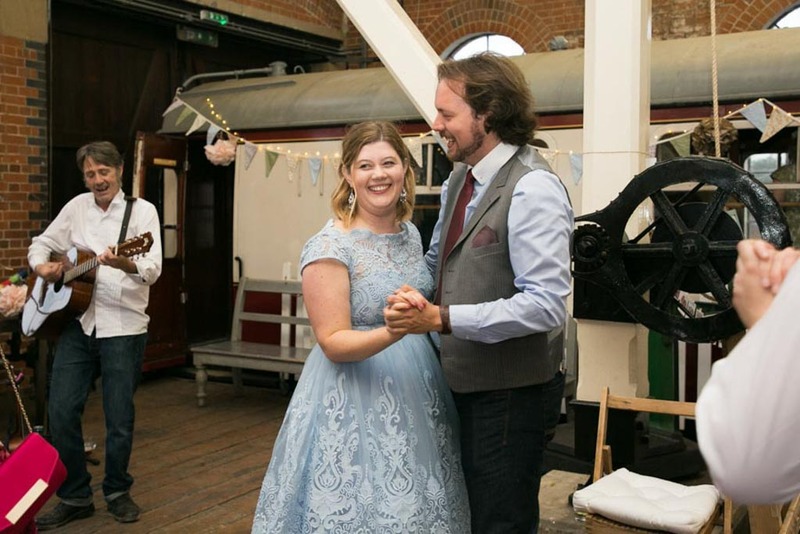 Once again, this non-traditional pair had no first dance, but those who fancied it stepped up to the dance floor to dance the night away. 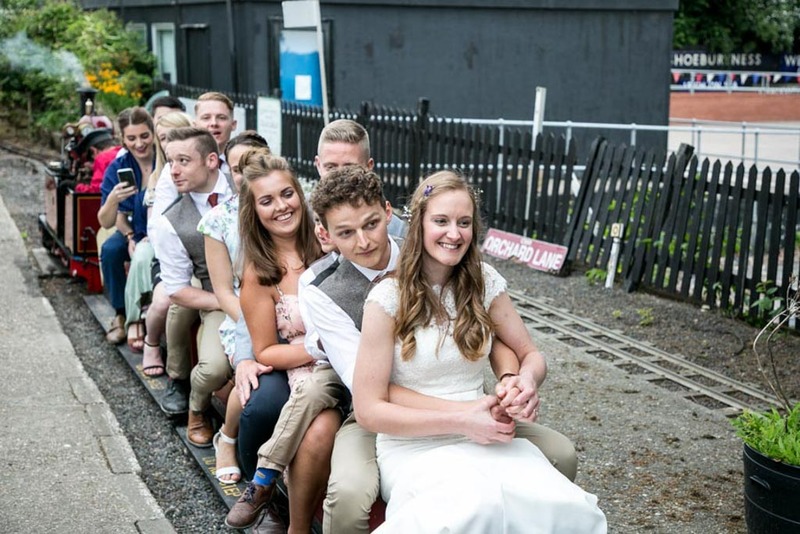 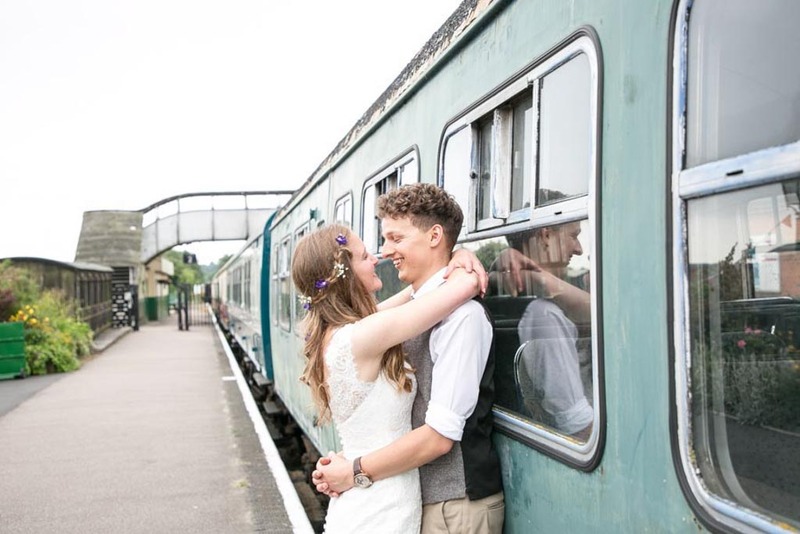 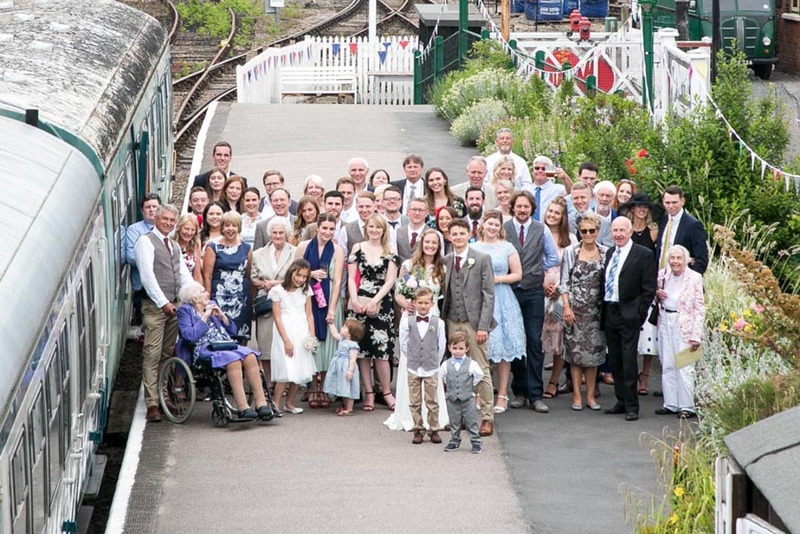 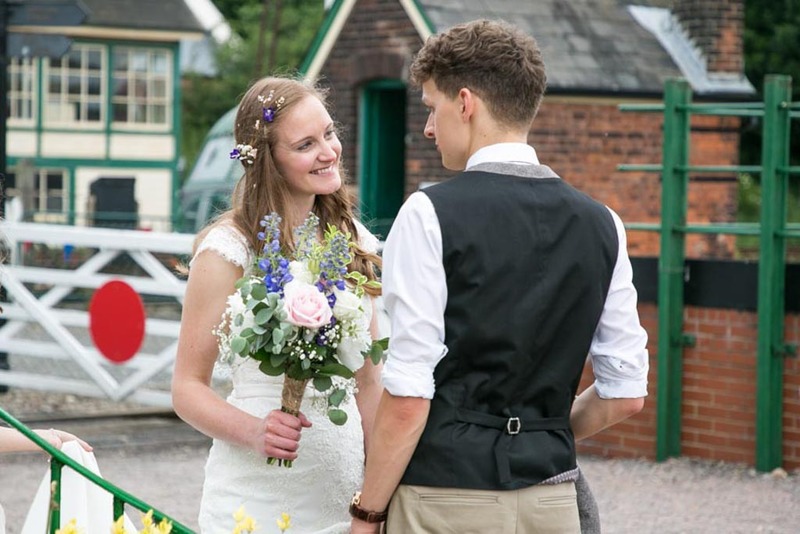 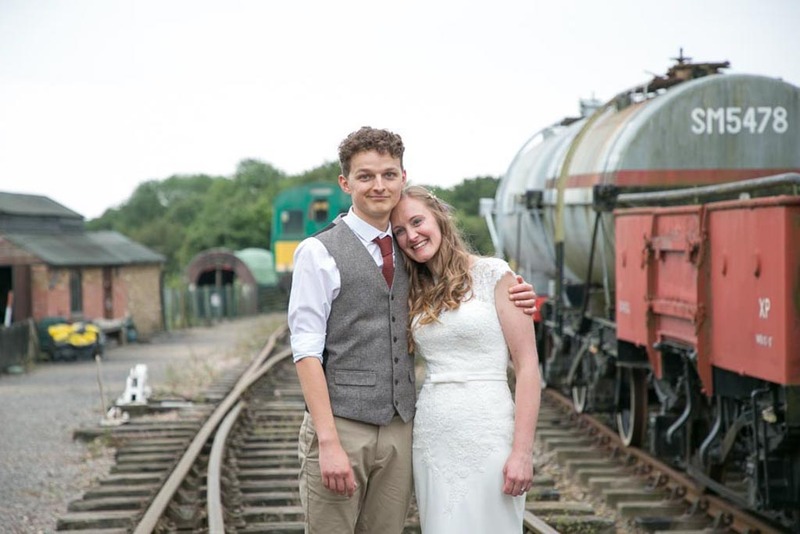 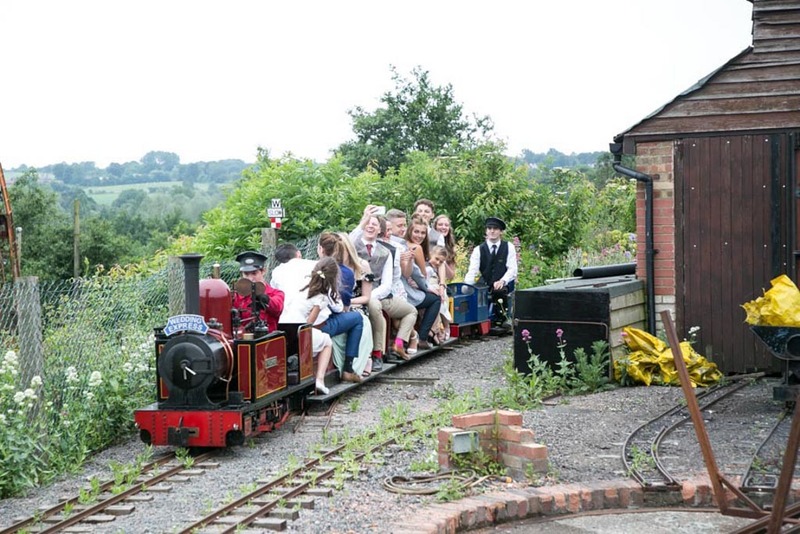 During the early evening the miniature railway was running, a load of fun for all the guests, and the bride and groom had a special ride just for themselves. 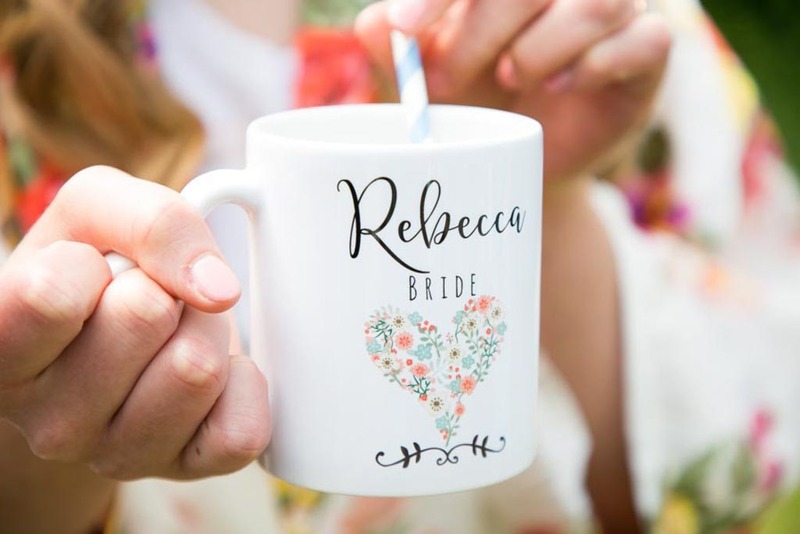 What a wonderful way to spend your wedding day! 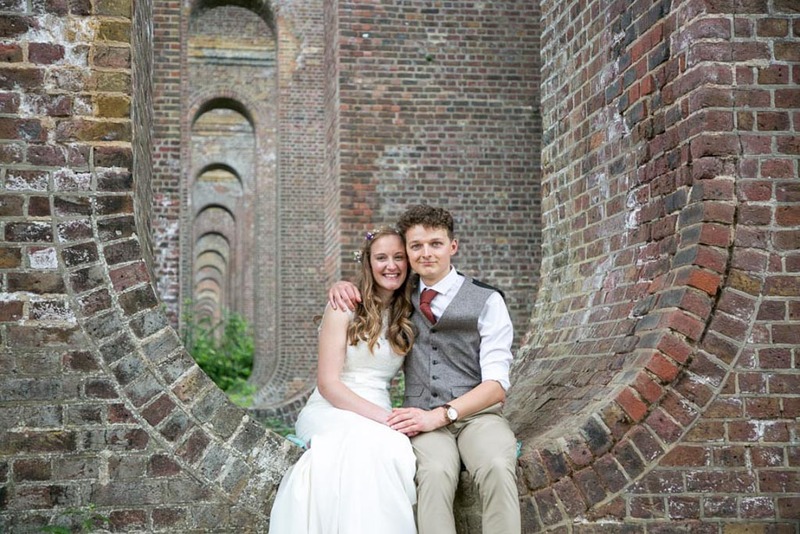 We met whilst studying for A levels at College in 2007, but were not dating until 2008. 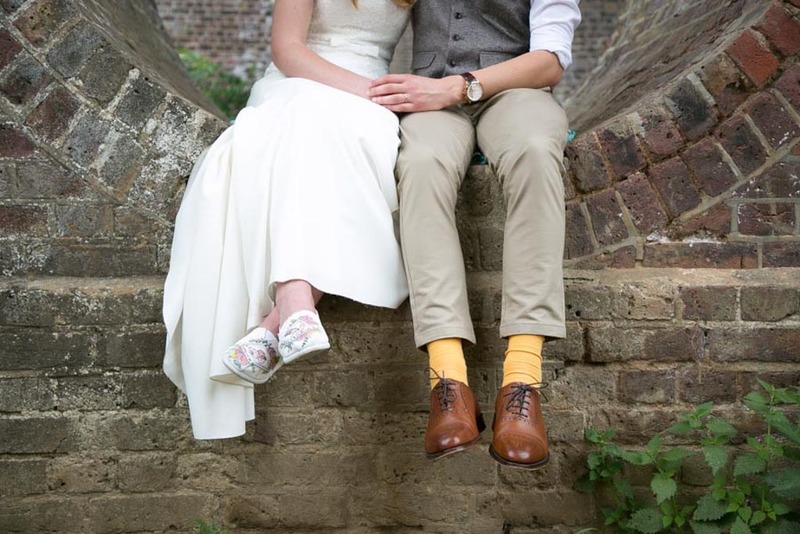 We have been together 10 years this year. 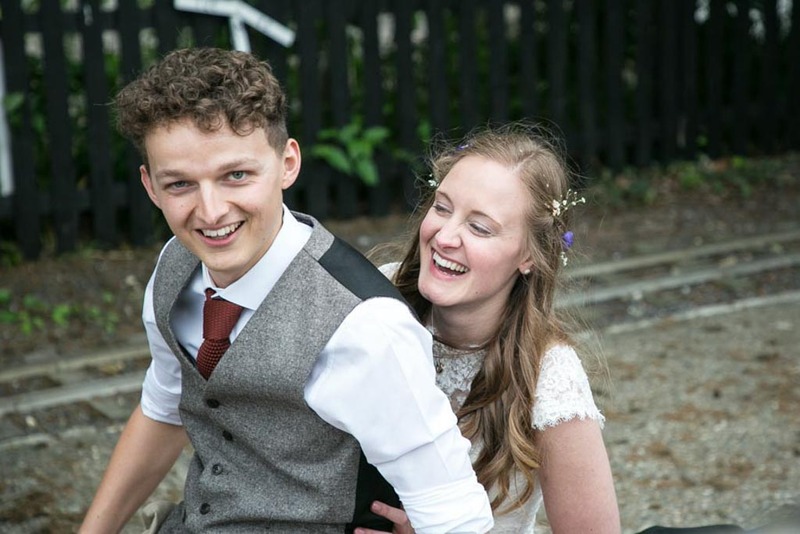 We got engaged on 26th October 2016. 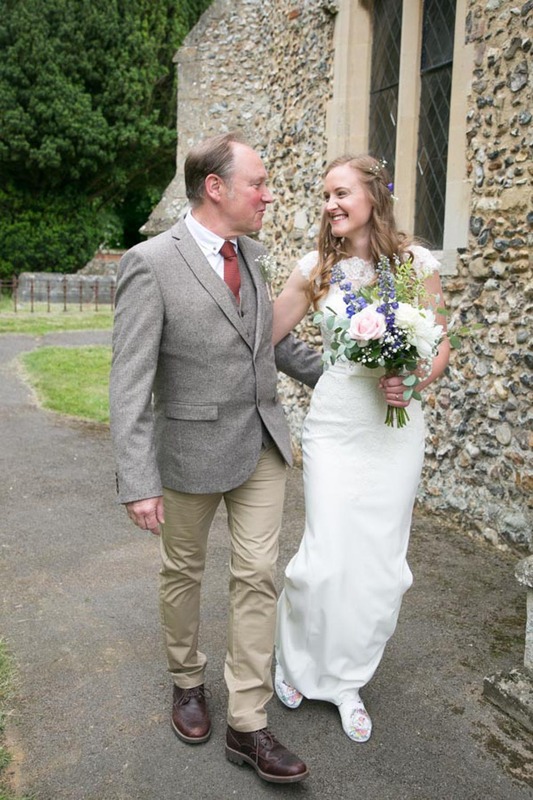 It was a Friday, Nick was at home and I had gone off to work. 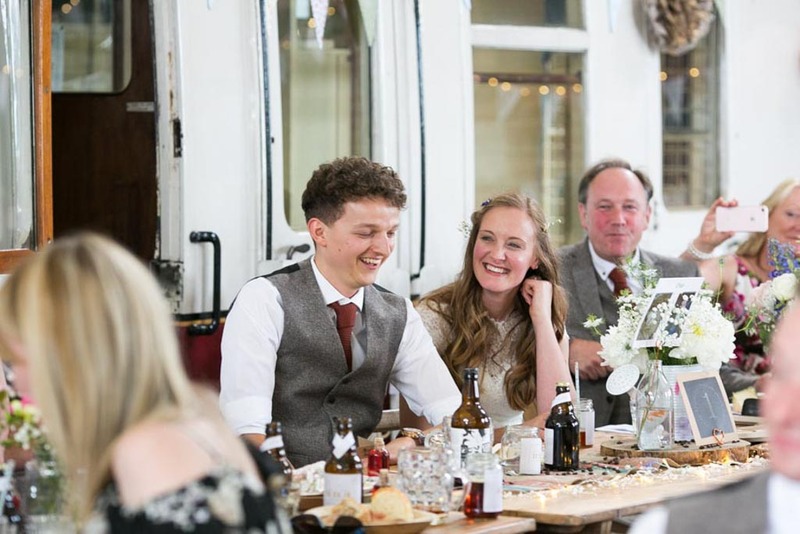 Nick had printed Polaroid photos of us through the years, probably around 100 or so and spent the day decorating the house, hanging photos on string in every room. 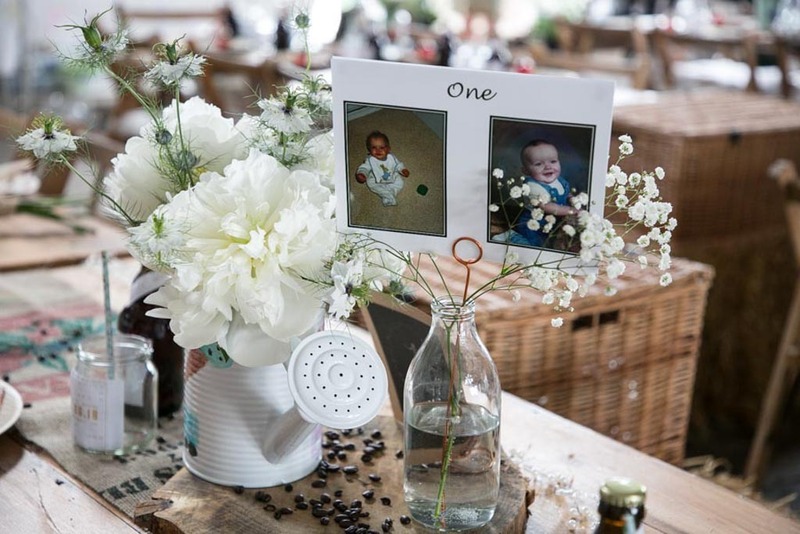 It was very autumnal outside, and he had also been and collected the most colourful leaves and hung these amongst the photos too. 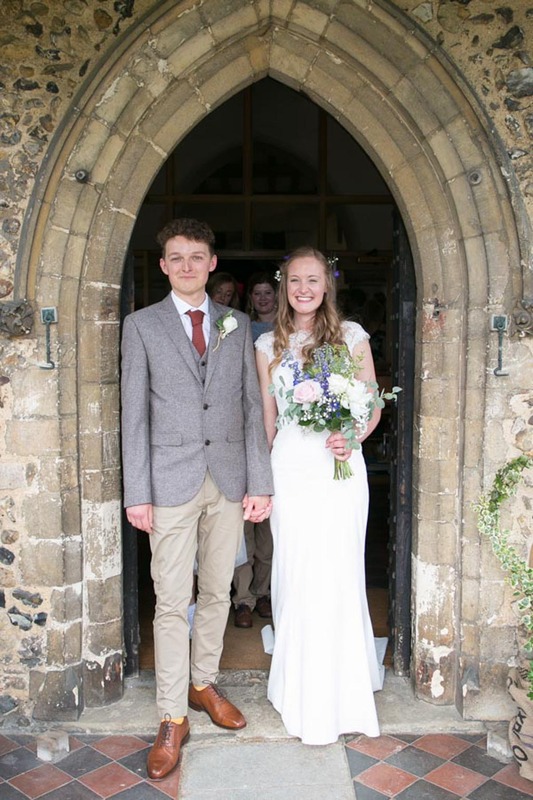 Fairy lights and rose petals led the way from the front door all the way out to the back, where Nick was waiting for me upon my return home, under a flower arch we have in the garden. 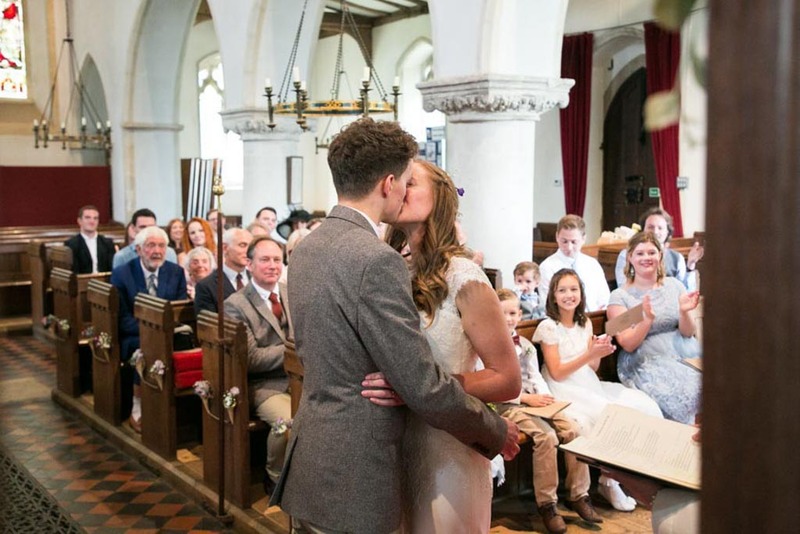 He got down on one knee and proposed with a bespoke ring and a bunch of roses, it was all very unexpected and a complete surprise! 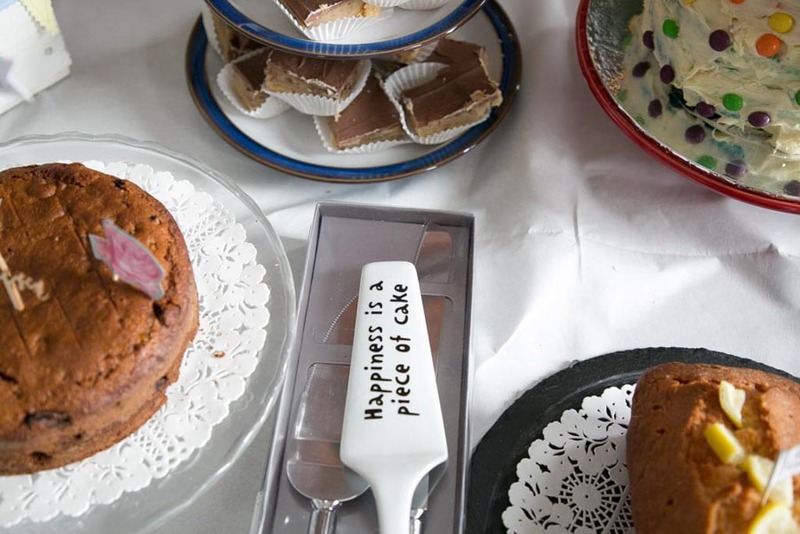 We continued to celebrate with a weekend in Gothenburg before sharing some celebrations with our families. 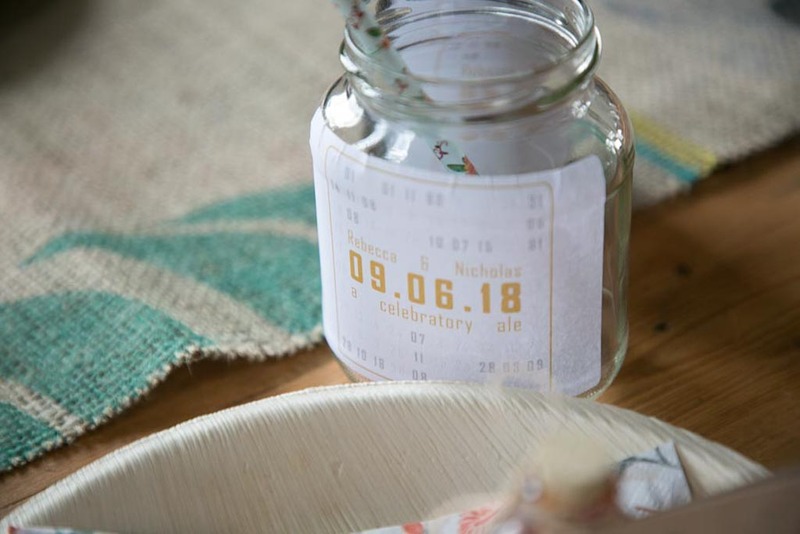 We begun our planning properly in early 2017, we didn’t really have much of an idea of what we wanted until we started looking. 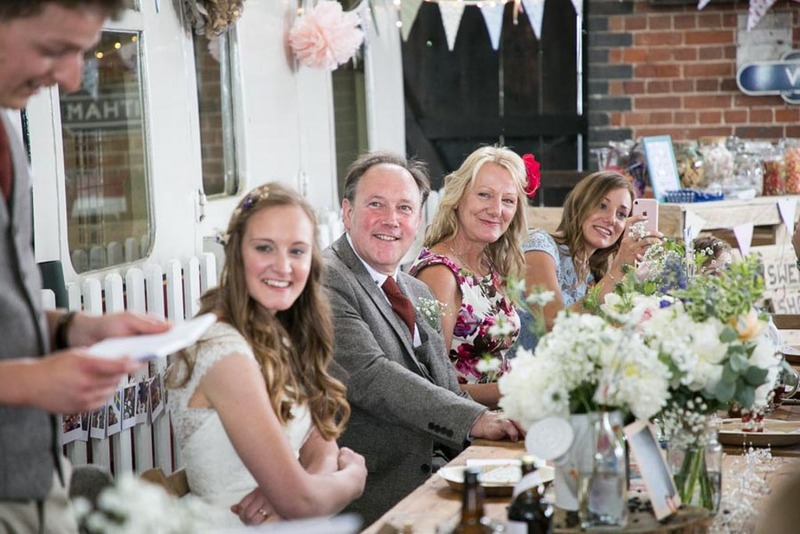 We looked at a few ‘all inclusive’ wedding venues, but were often left disappointed that we wouldn’t have such an involved role in the details and there were a lot of restrictions on what food and drink suppliers we could have, which put us off. 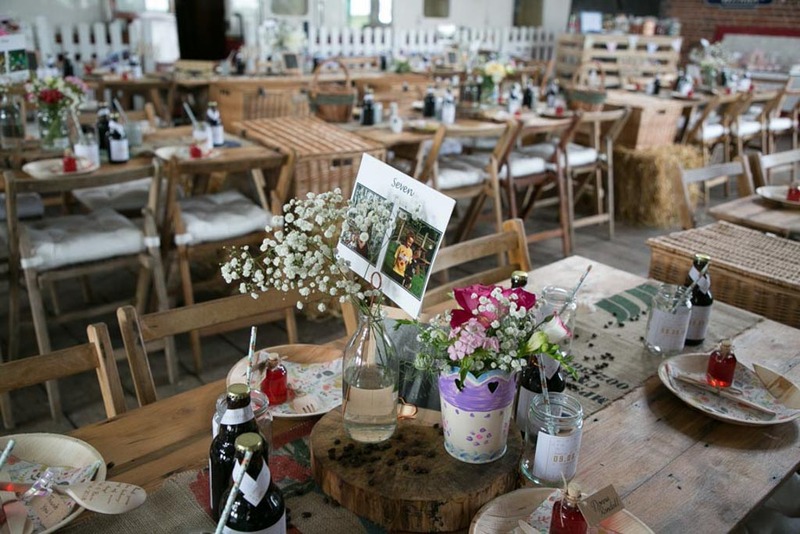 We decided that we wanted to be able to do whatever we wanted, so needed a DIY venue, which would mean that we would have complete freedom to choose the suppliers we wanted for each aspect of the day. 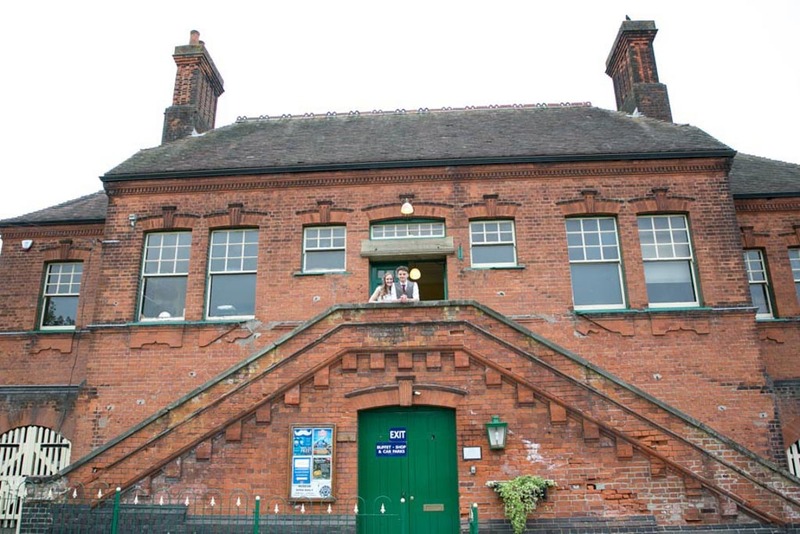 We were familiar with the East Anglian Railway Museum as we often frequent the beer festival, which is held there. 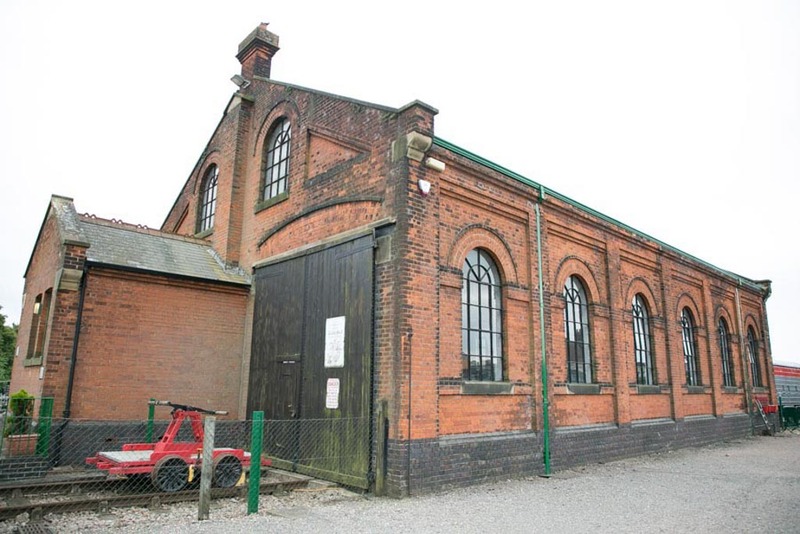 However, we were unaware that that you could hire out the goods shed. 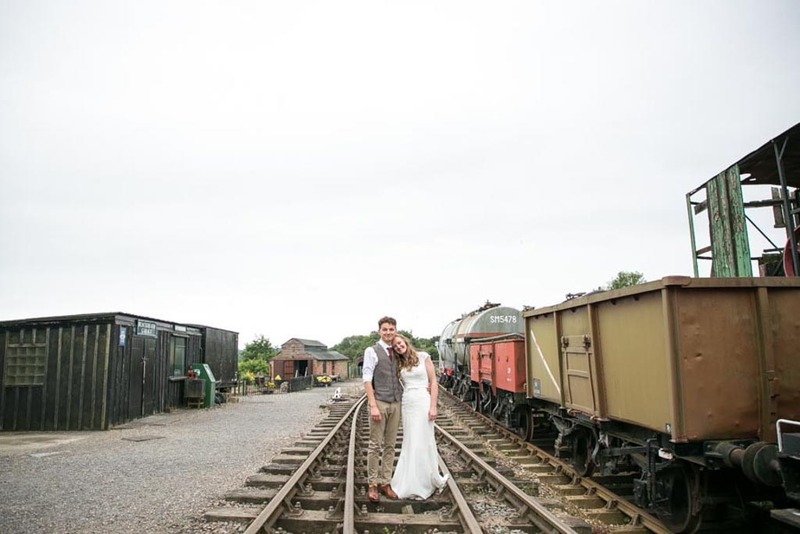 We went for a look and completely fell in love with it, the Victorian buildings and vintage trains called out to us. 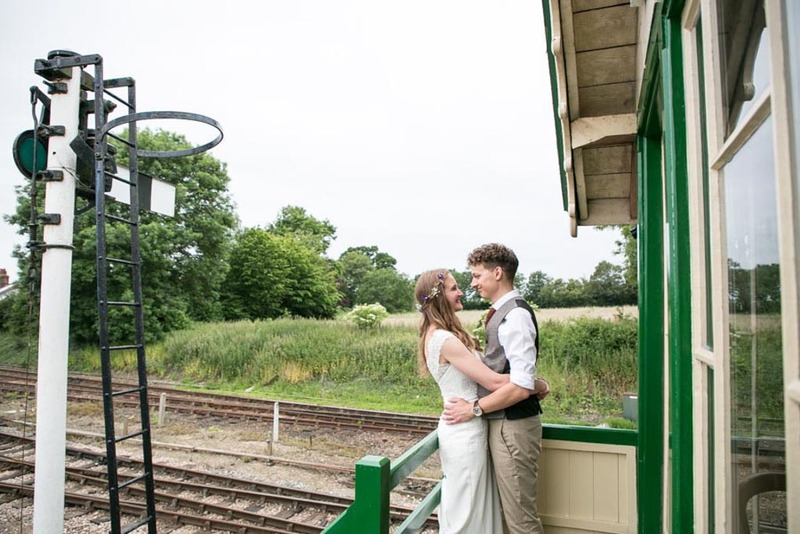 Nick’s Grandad was also stationmaster for a different station in Essex and lived in a Victorian station house, just like the one at the museum, until quite recently. 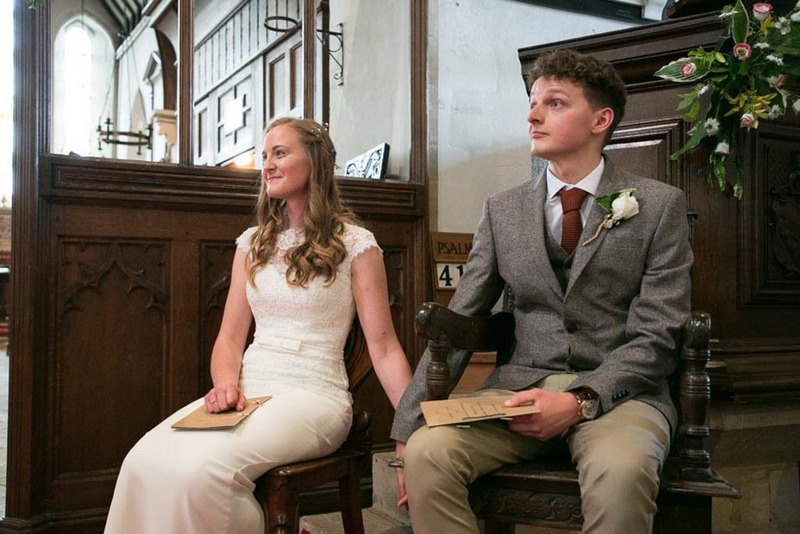 It felt very personal to us. 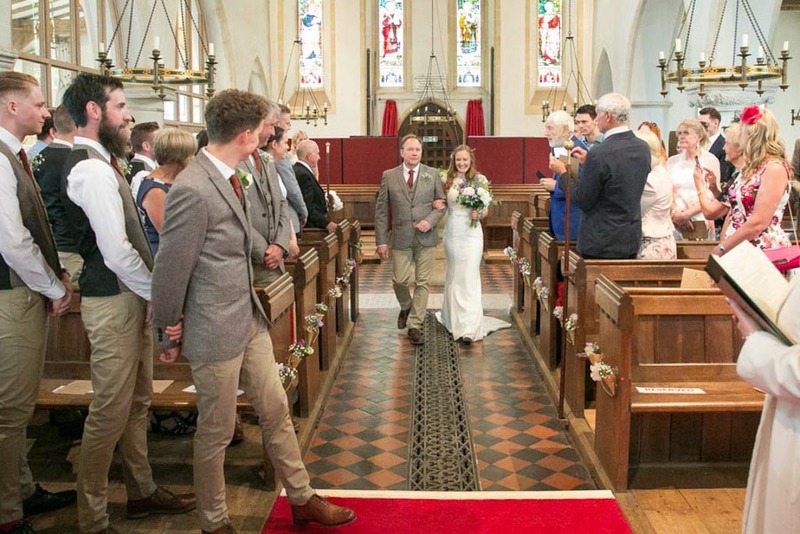 Once we had decided on the Museum for our reception, we explored local churches for the wedding ceremony itself; there was only really one option, which was the nearby village church in Stisted, where my parents lived. 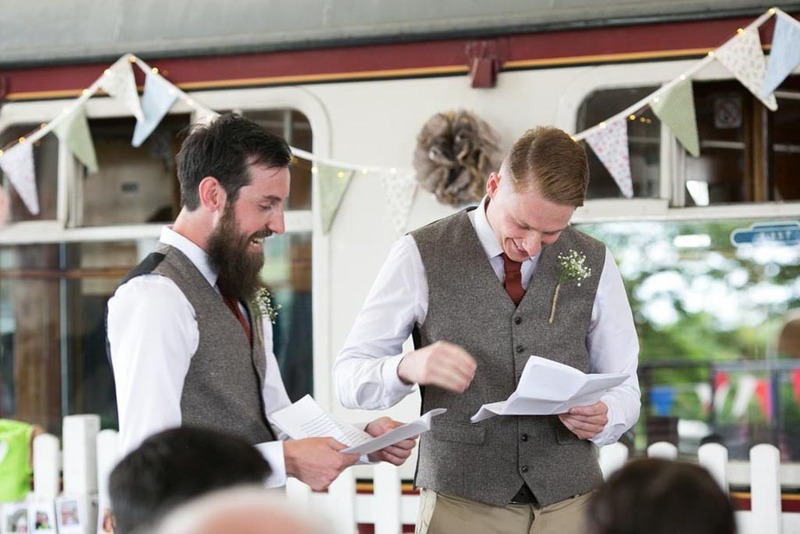 Both venues meant something to both of us, which made it all the more exciting. 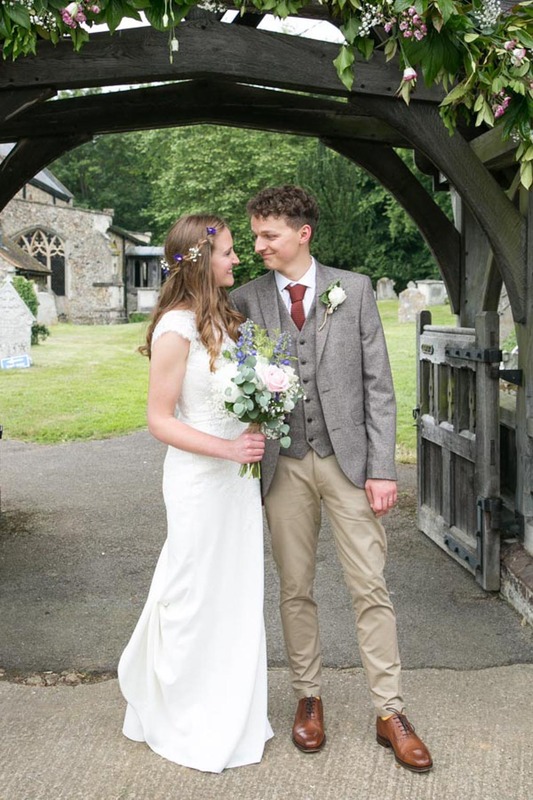 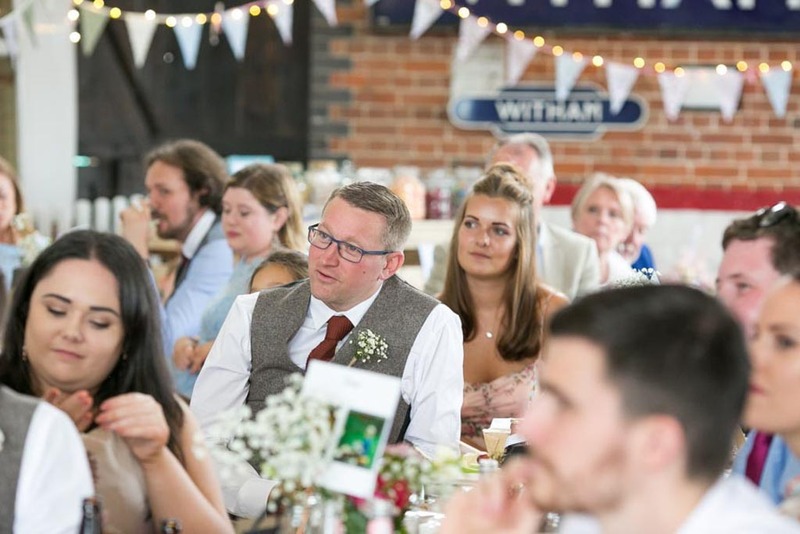 From when we had the venues booked, everything went very smoothly, we were very organised and booked our photographer, food, drinks and furniture about a year in advance. 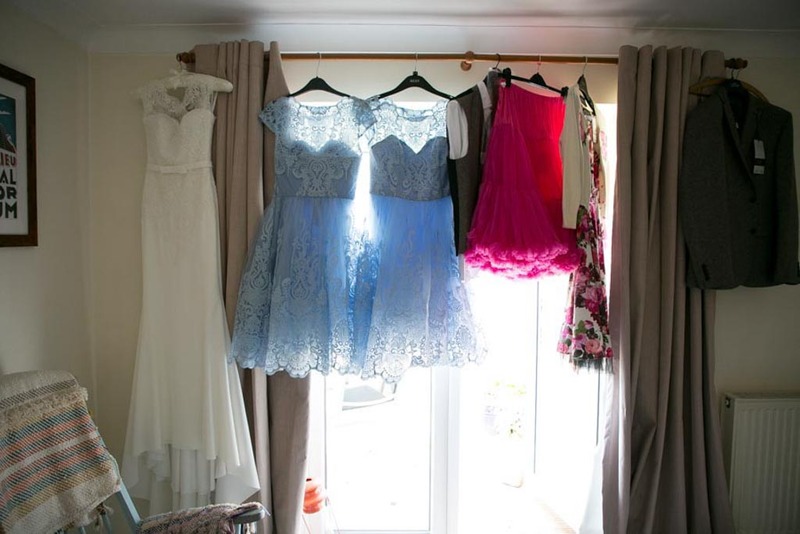 Most of the suppliers we chose, we had sampled or heard of before at various events so we knew what we wanted and booked them in before they could say no! 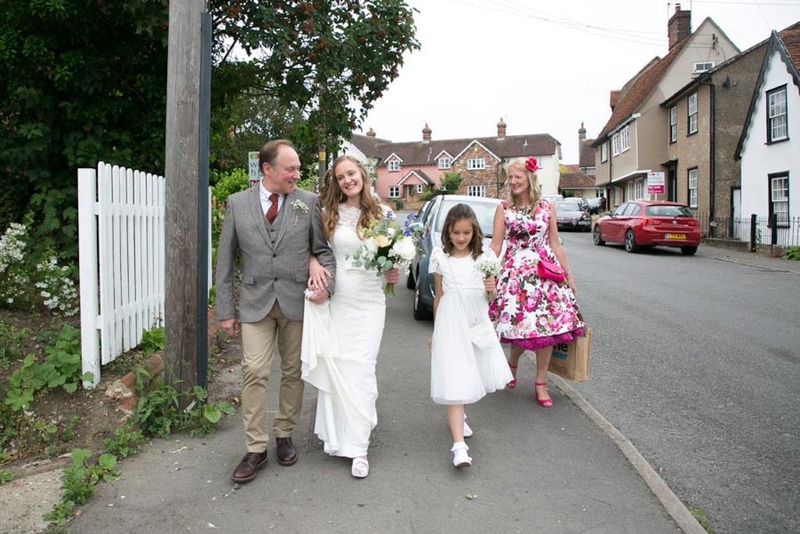 The lead up was a little more frantic, as we had so many aspects we DIY’d but all our family pitched in and helped us out, it was actually such a fun time. 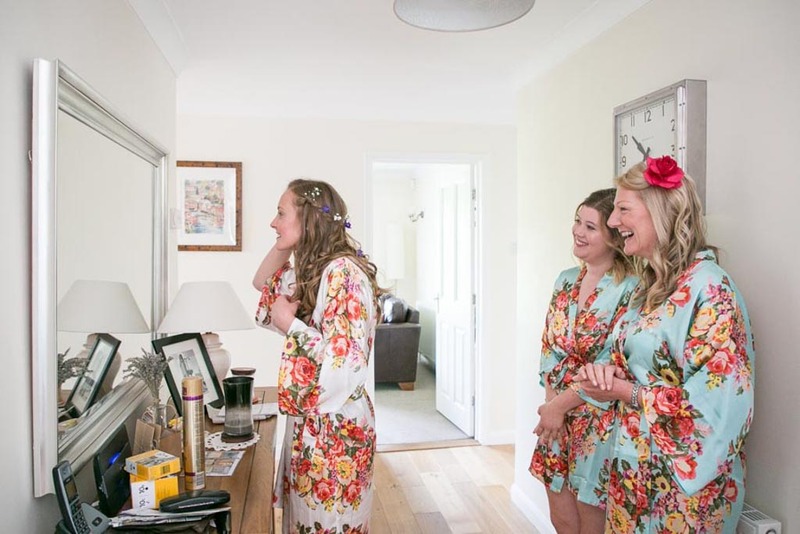 Whenever we felt panicked we would just tell ourselves we were simply throwing a party, and how hard can that be! 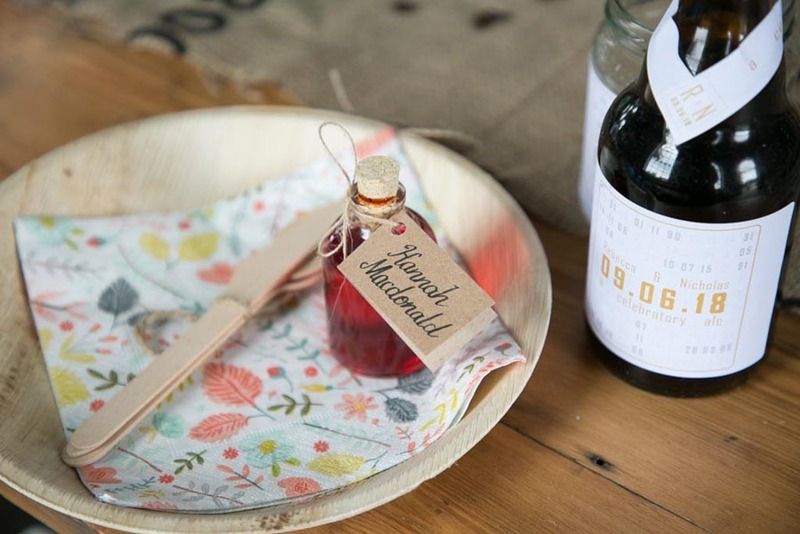 We made sloe gin and brewed our own beer for favours. 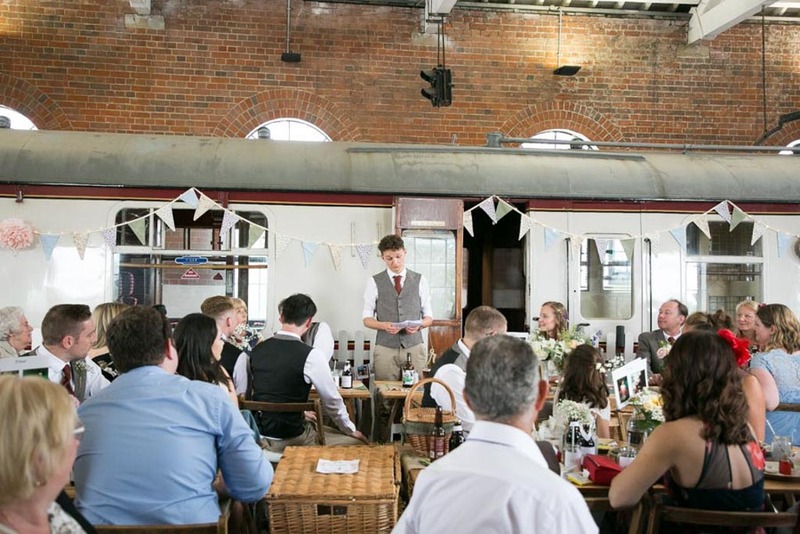 We also designed and printed all our own stationary, including the invitations and order of service. 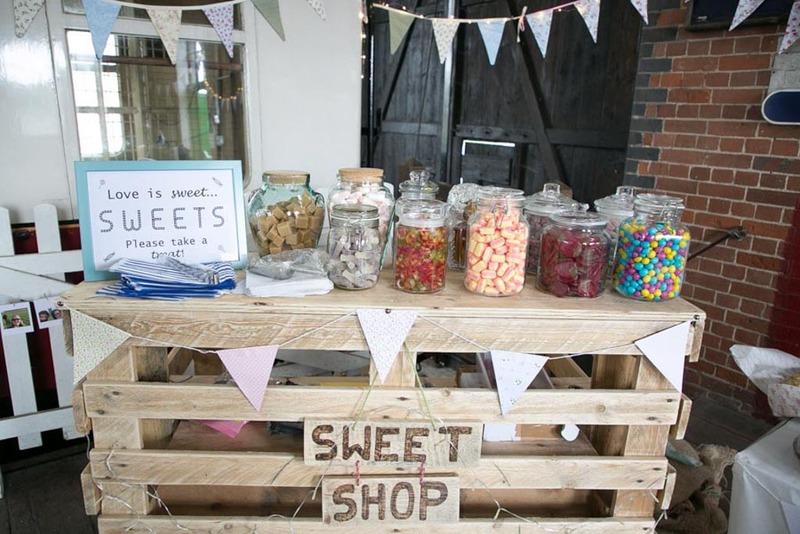 We made a lot of other things including a wooden ‘N’ and ‘R’ which we wrapped in fairy lights and propped outside the venue, table runners from old coffee sacks, a sweetie bar, and a wooden trolley for the pageboy. 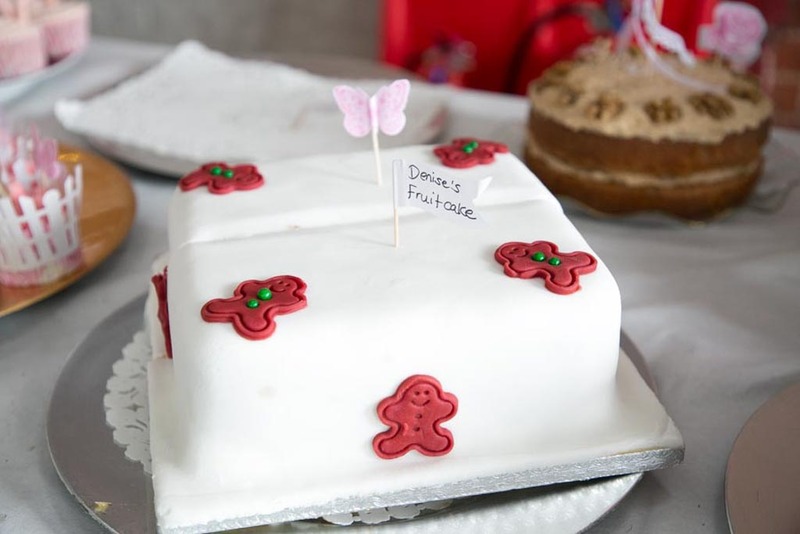 The DIY aspect continued to the day as we asked family and close friends to help us create a ‘village fete’ style cake table, we all made something edible to add to it on the day. 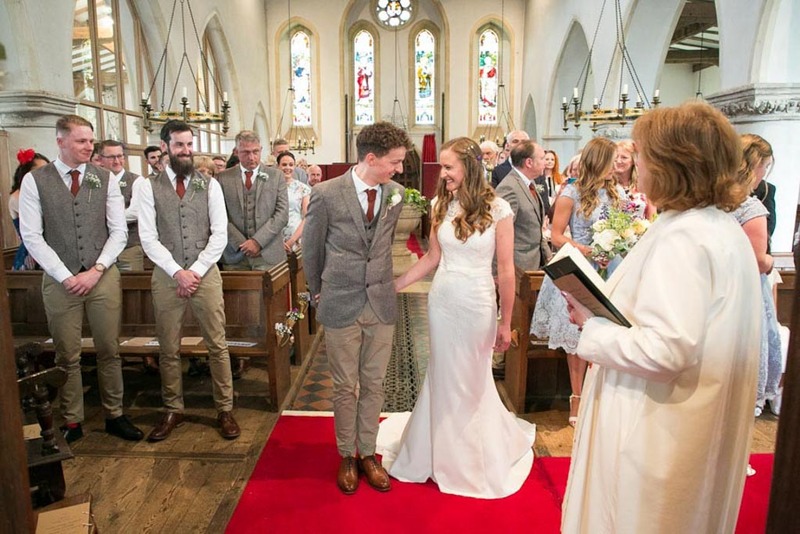 One special touch that we both really look back on with such fond memories is the organ music from the ceremony. 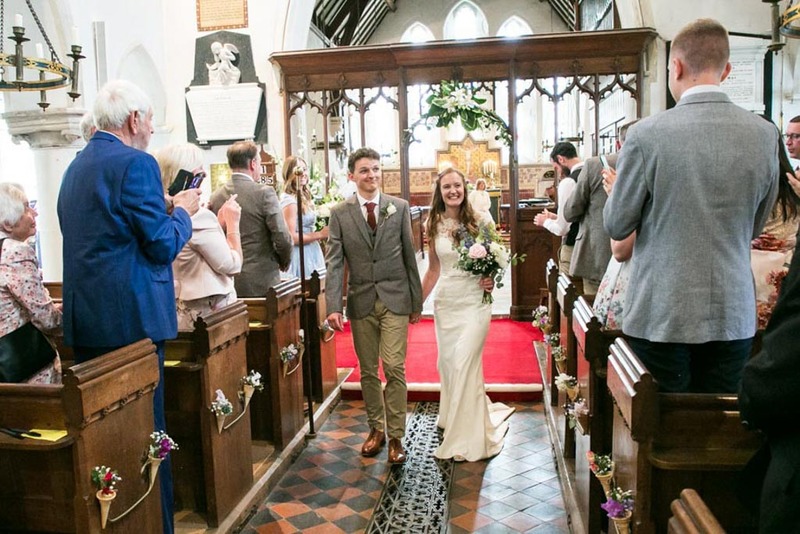 Our organist played ‘Married Life’ from the Disney film ‘Up’ whilst our guests were arriving. 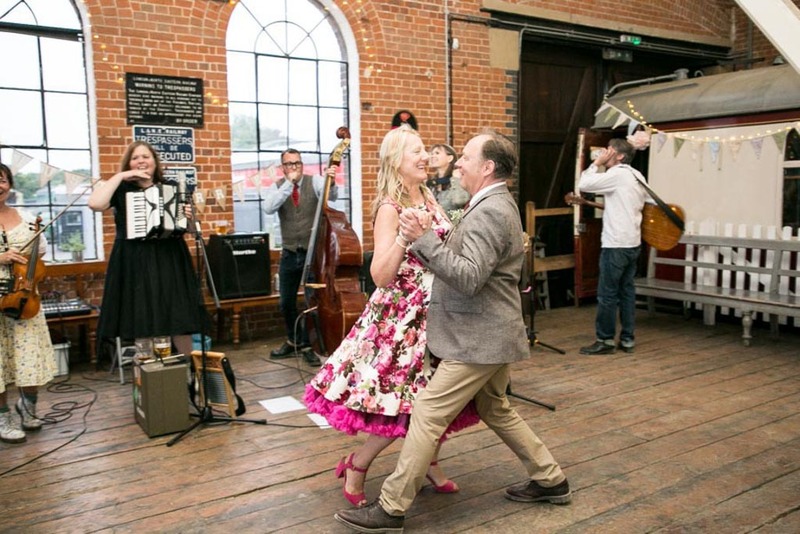 It’s one of our favourite films and such a lovely melody. 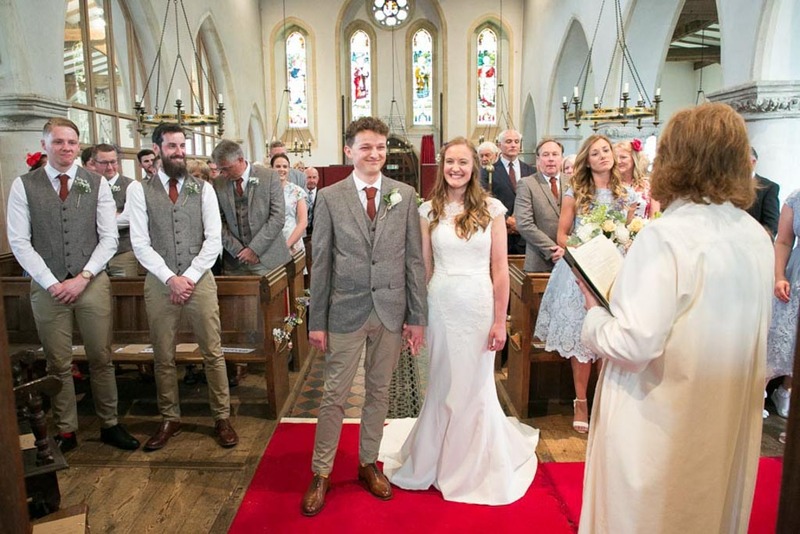 Luckily a few days prior to the day we bumped in to our organist at the church by chance, so I was able to hear it too, otherwise I’d have missed it on the day! 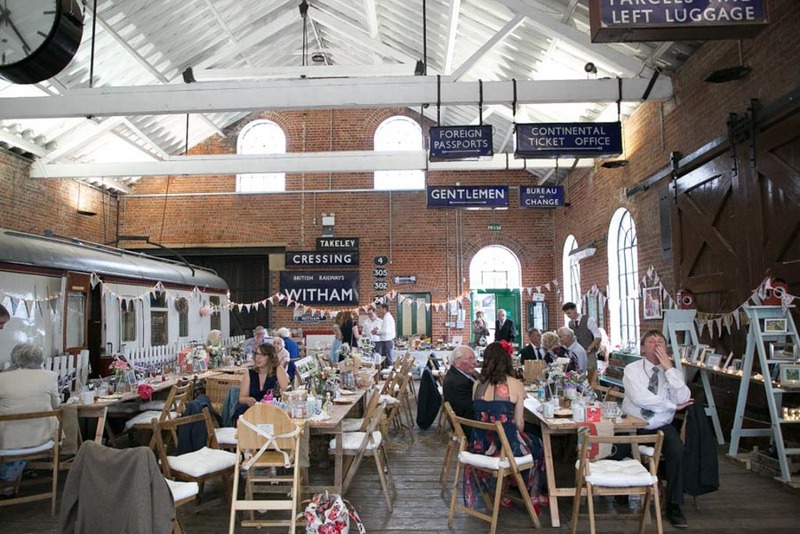 There was not a theme as such, though the venue certainly lent itself to all things vintage and train related. 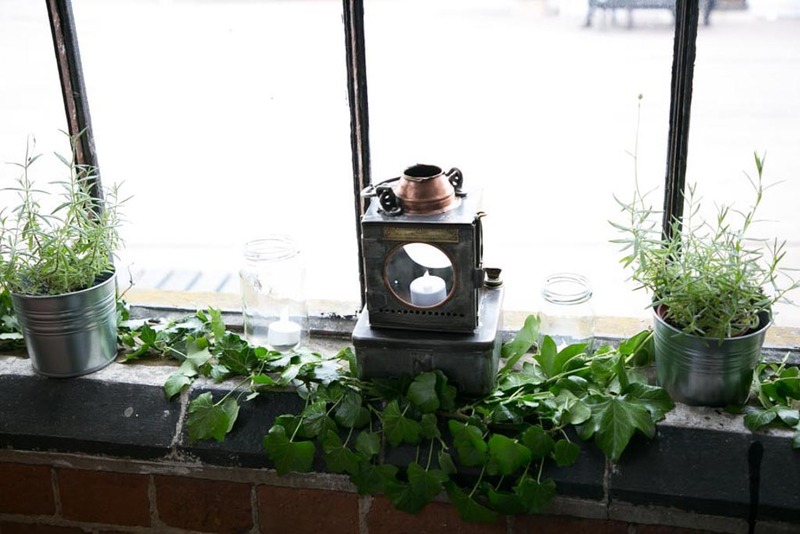 Particularly with Nick’s links to the railway, old workmen’s railway lanterns appeared and featured in our décor, which added to the surroundings. 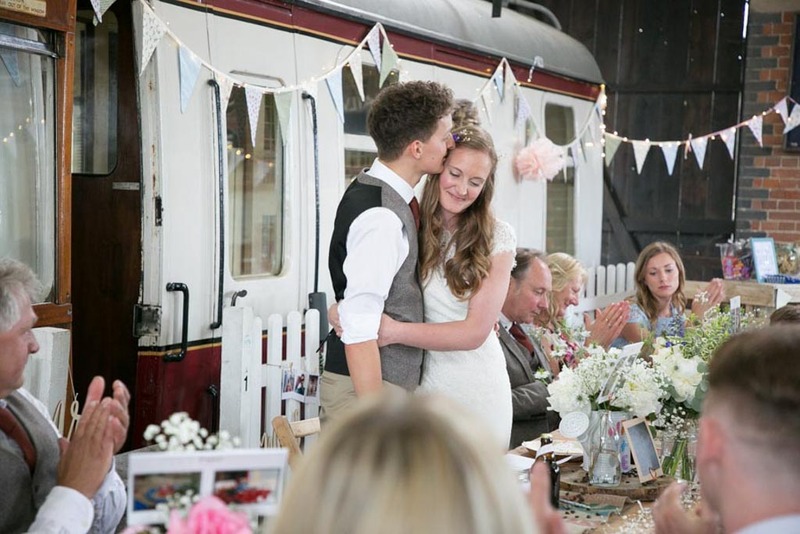 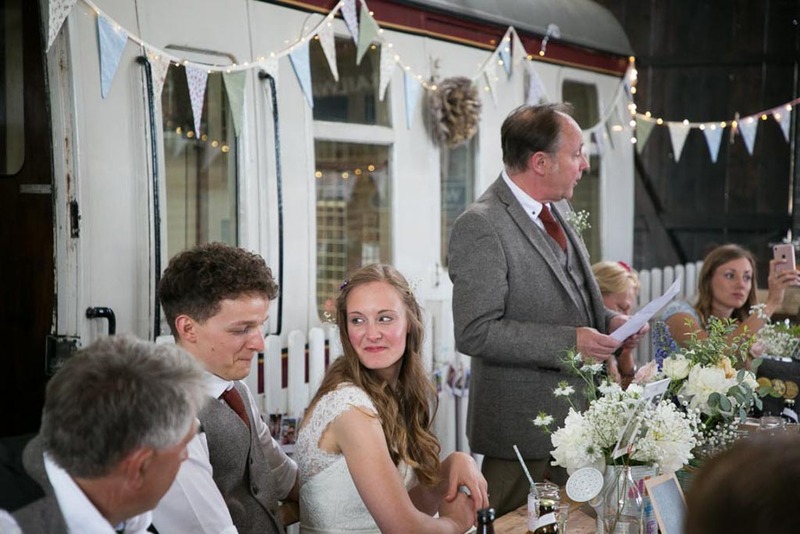 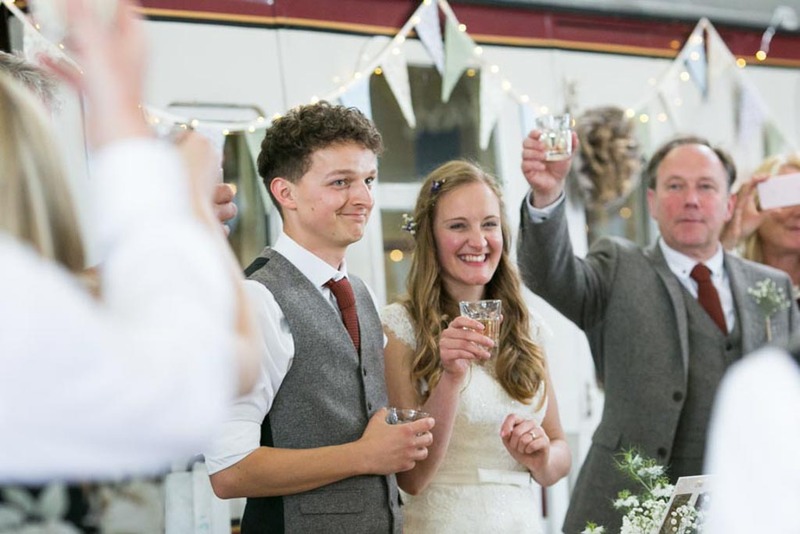 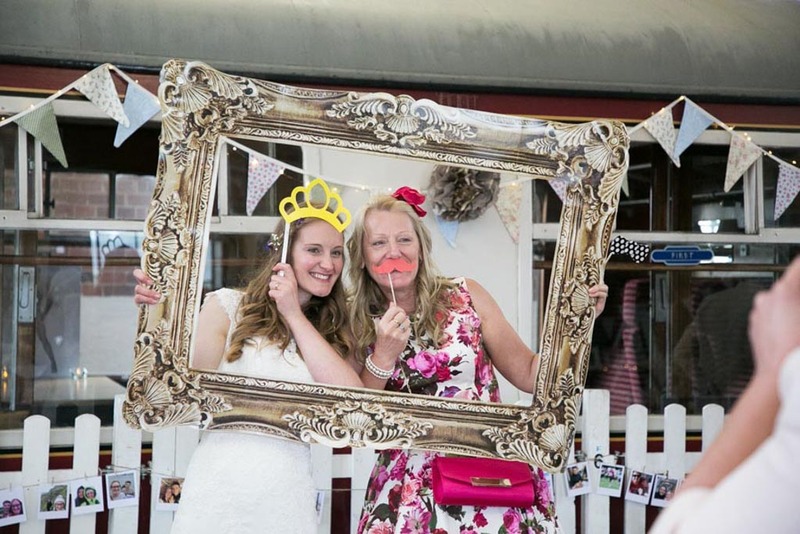 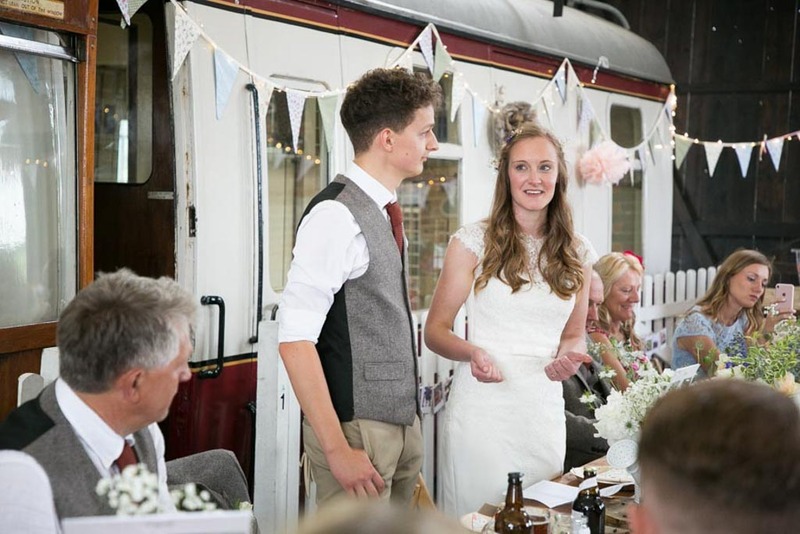 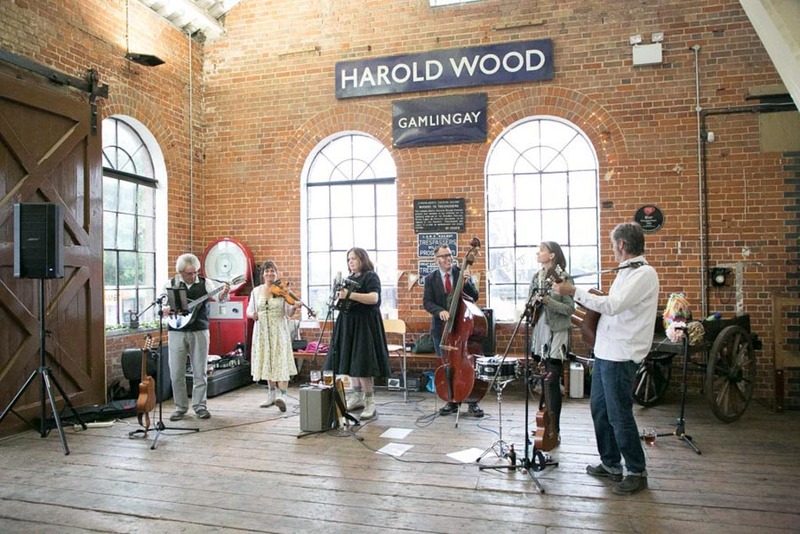 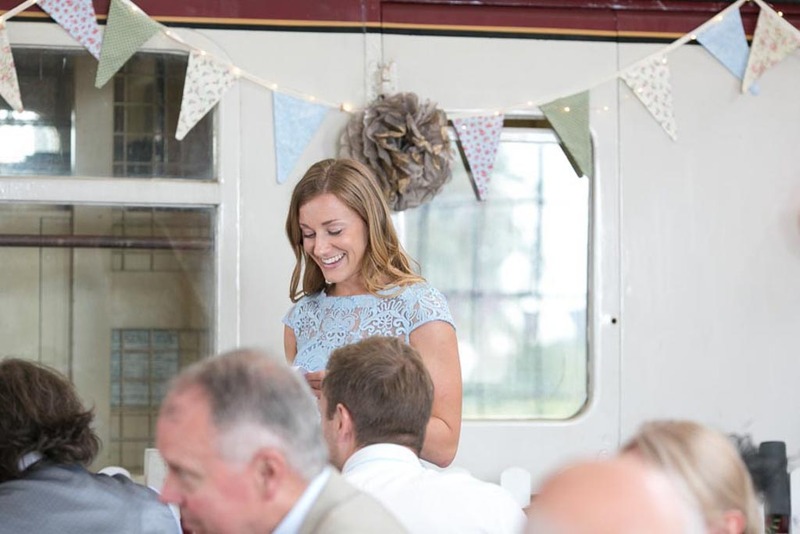 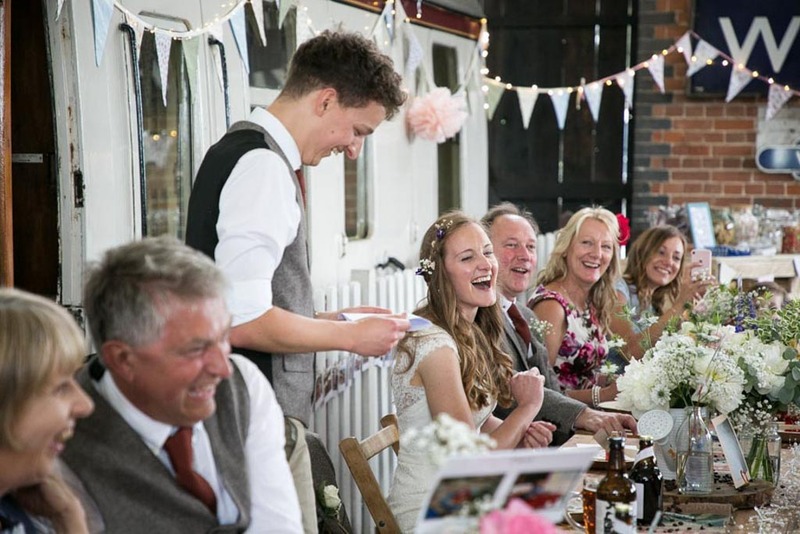 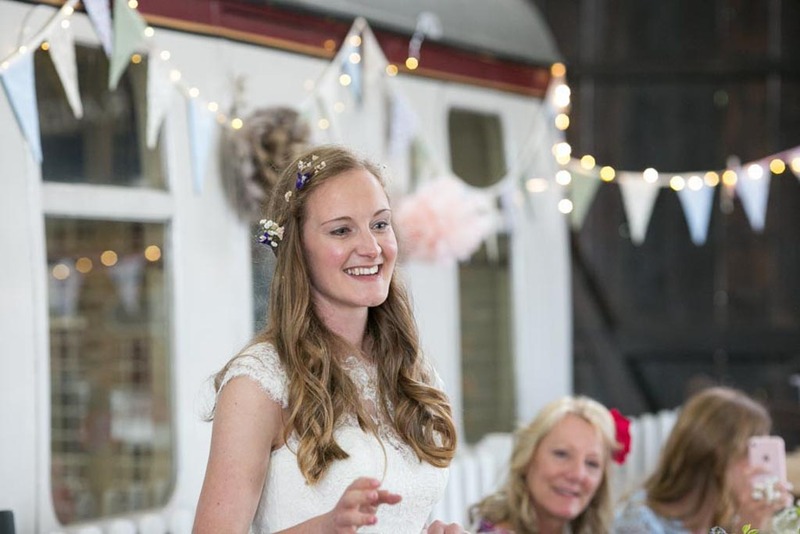 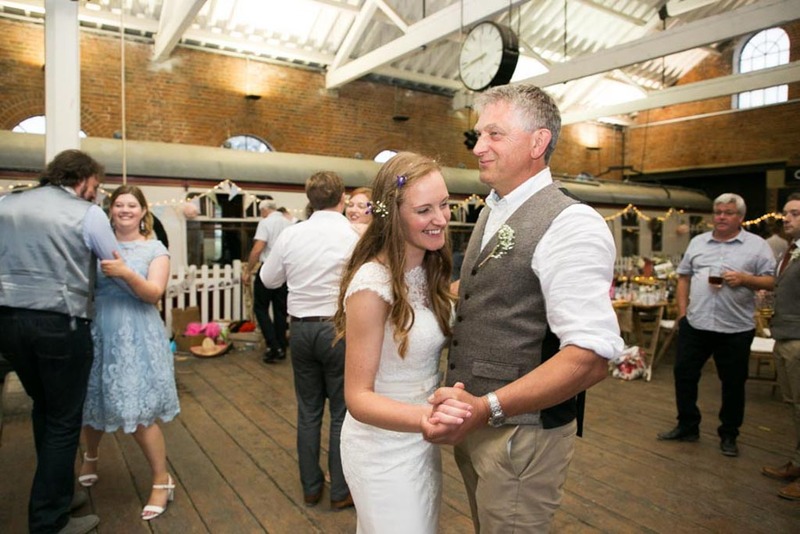 We also had an abundance of vintage style bunting adoring the platform and the goods shed. 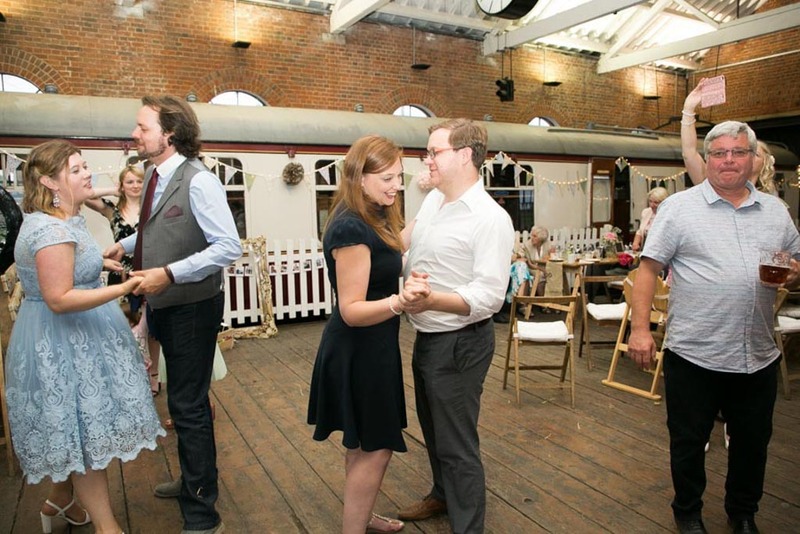 Unintentionally the day did have quite a vintage tea party feel to it. 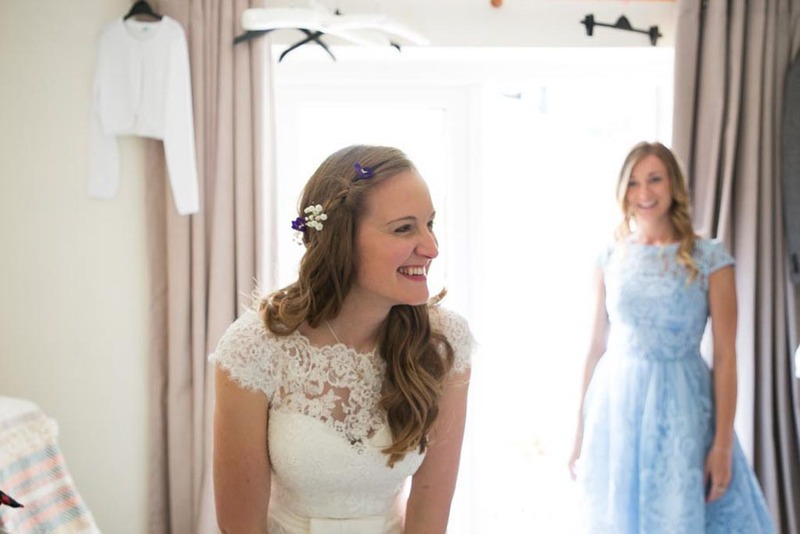 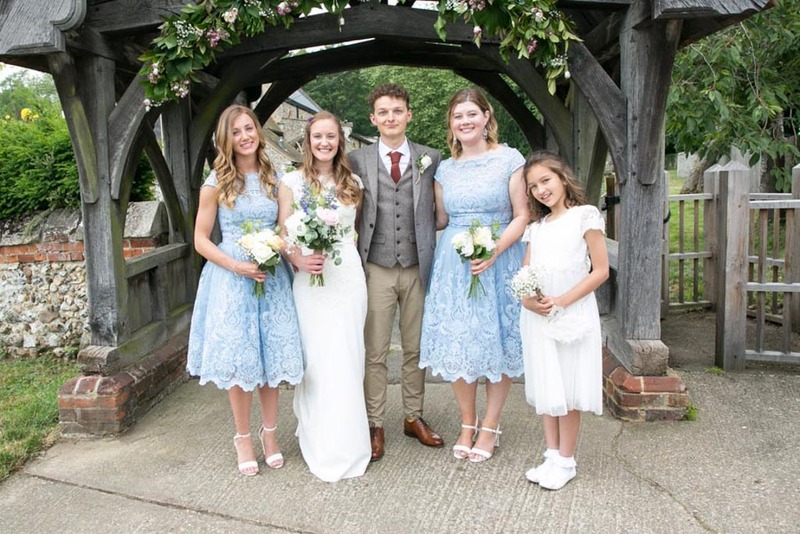 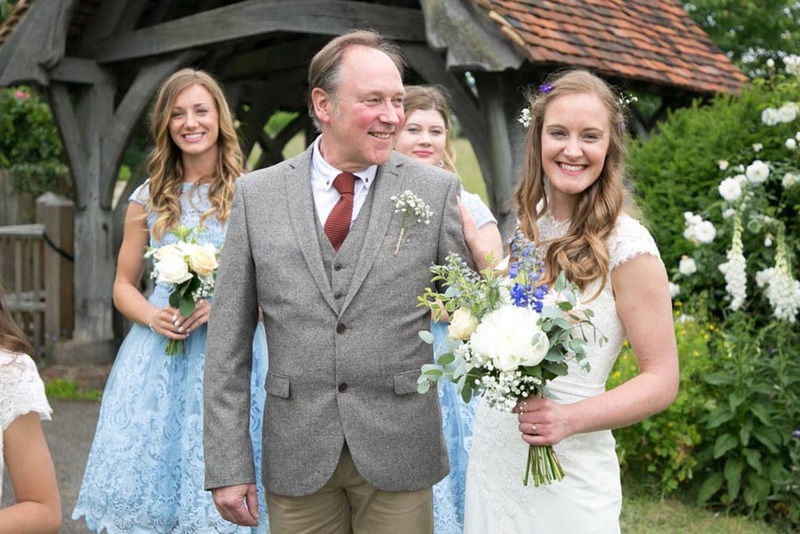 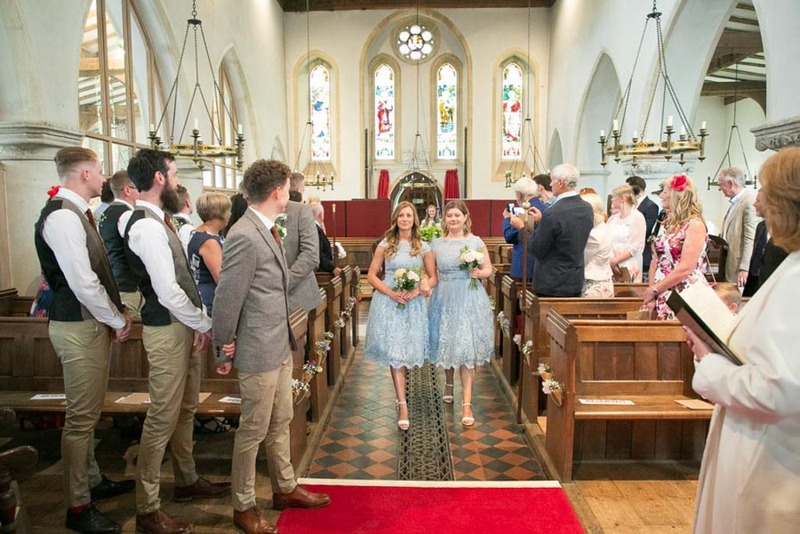 With it being spring we wanted it to be colourful and to represent us, there were a lot of pastel colours, including light blue bridesmaid dresses. 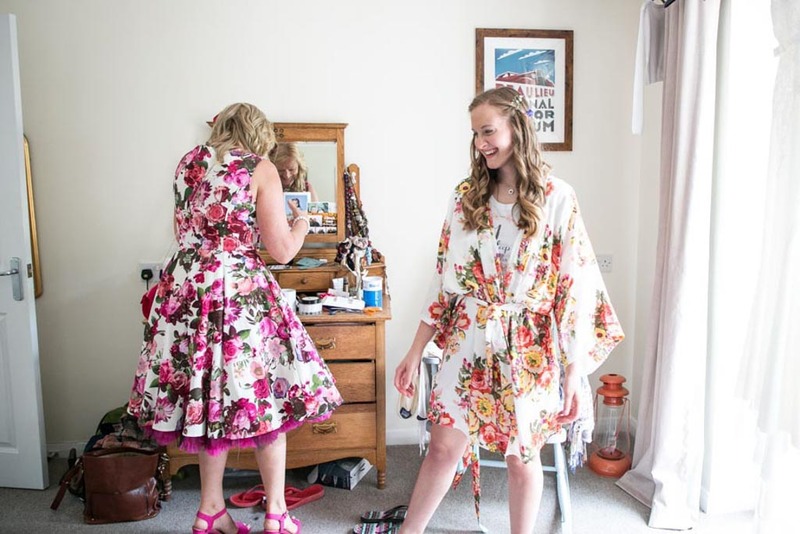 We tend to like mis-matching items in our home, so it was very much an ‘anything goes’ type attitude. 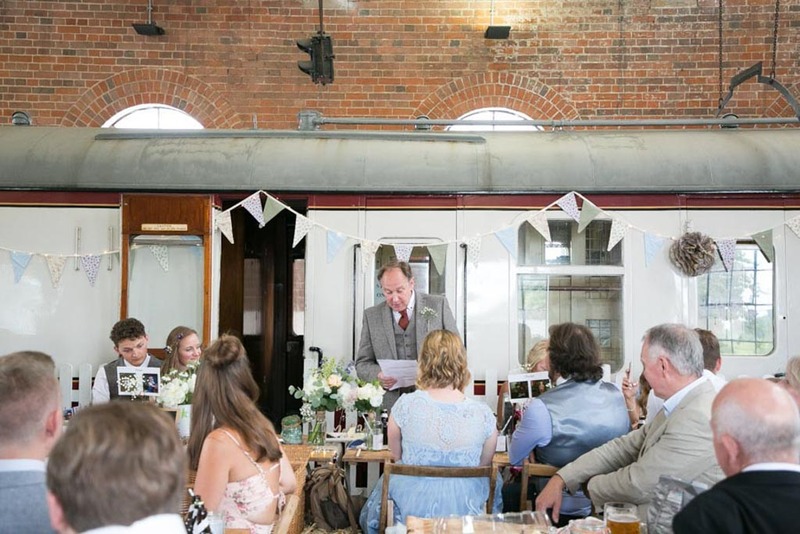 If we liked something we would try to incorporate it in to the day, regardless of the colour and luckily the goods shed at the museum lends itself to such a rustic, ad-hoc look. 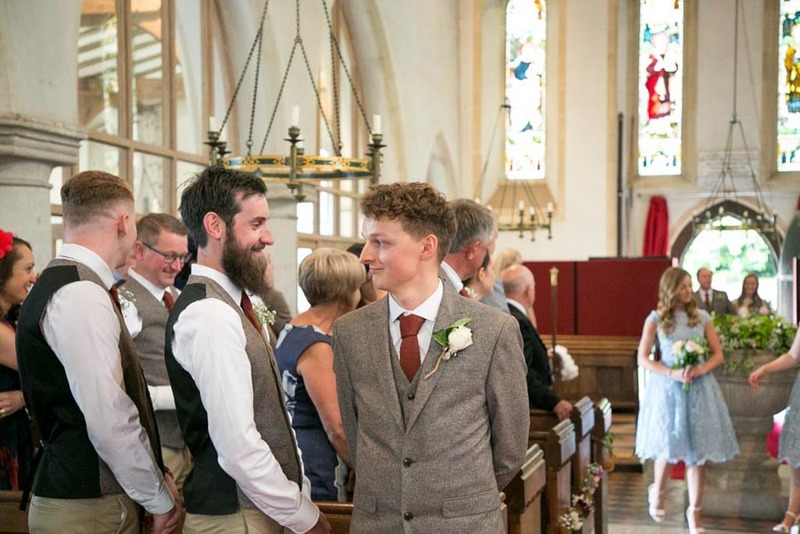 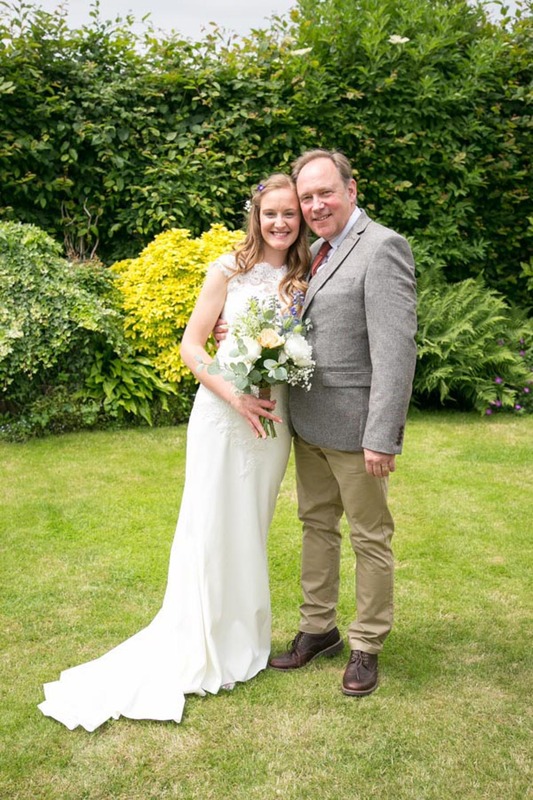 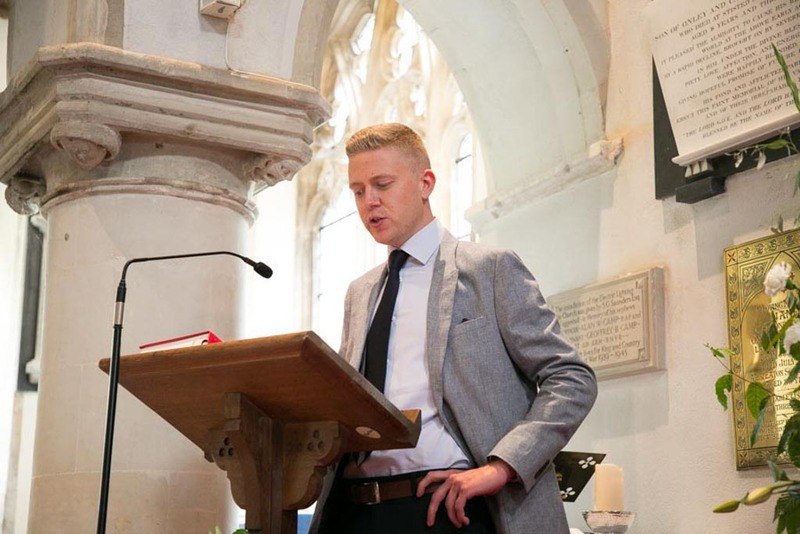 Nick’s best part was catching his first glimpse of me and watching me walk down the isle and being reunited with him at the altar, he says the relief of having me back by his side after a nervous nights sleep and busy morning was overwhelming. 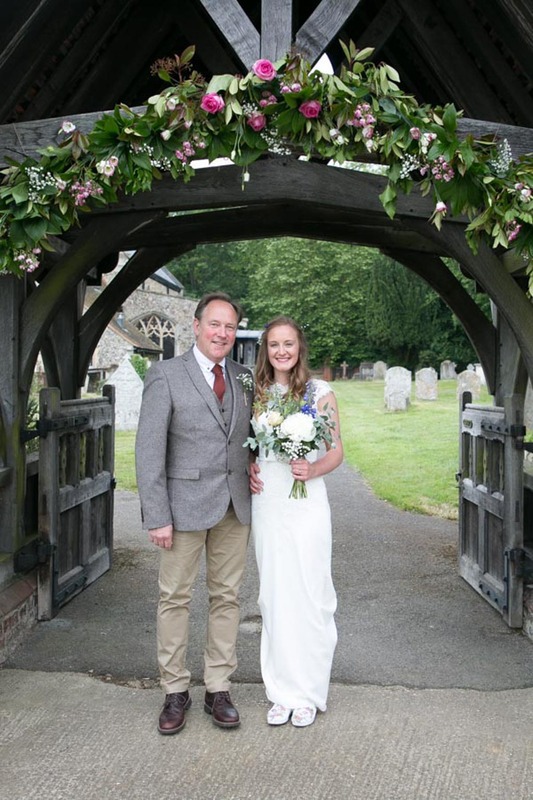 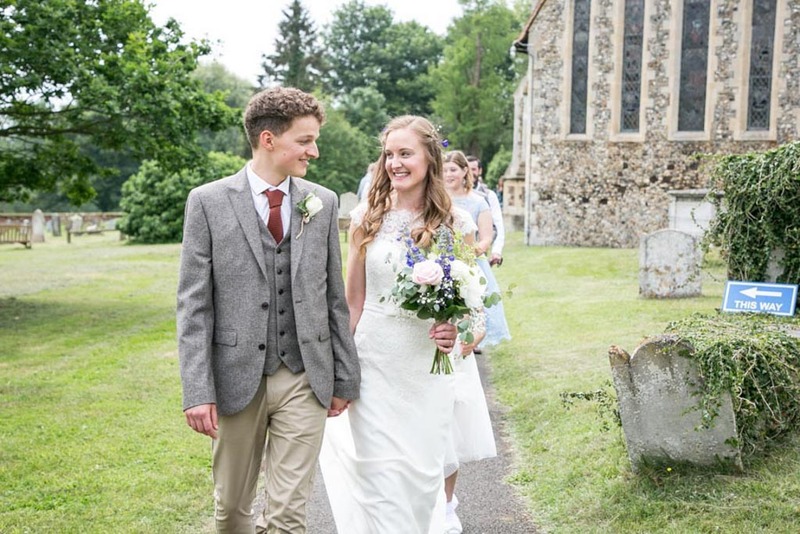 Equally, my best, and most poignant moment was walking out the church as husband and wife and listening to the bells ringing and feeling completely overjoyed. 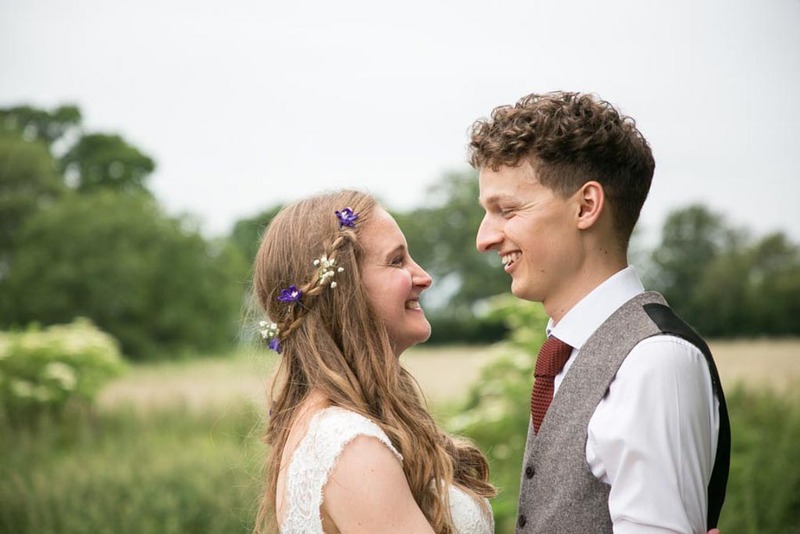 To know that we were officially husband and wife was the happiest I’ve ever been, and I knew that however the rest of the day was to go, it wouldn’t stop me smiling. 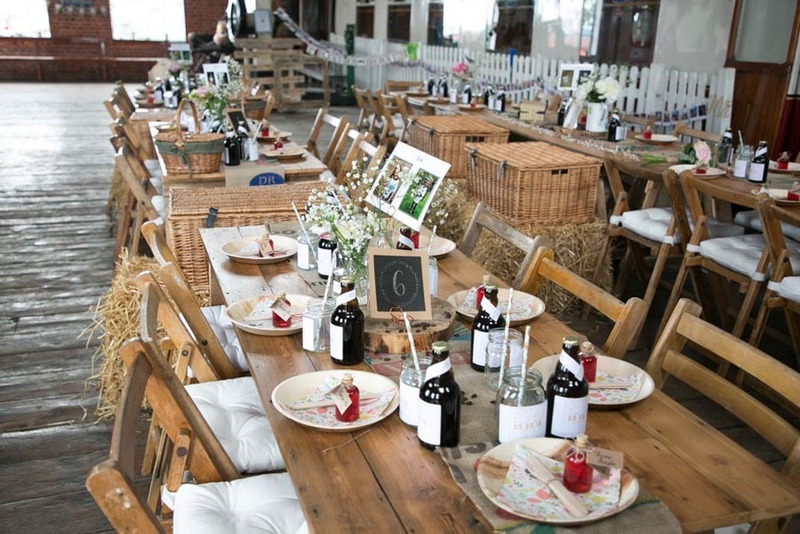 We would take the time to savour more of the food and drink, which we had lovingly chosen and made! 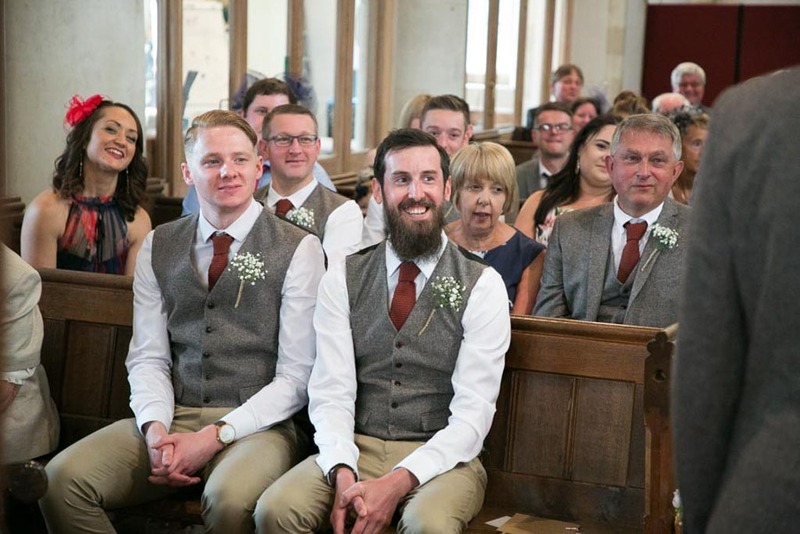 With all the excitement it felt as though we didn’t eat that much. 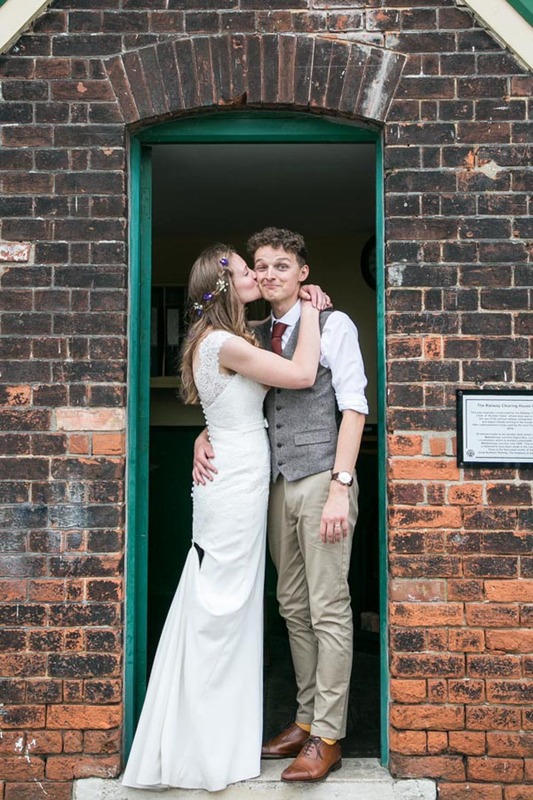 But overall, we would not change a thing. 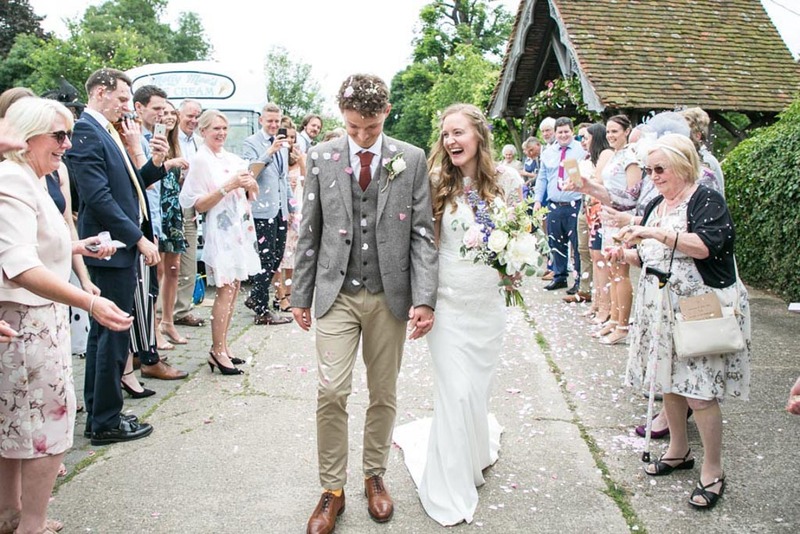 We have both said that it was the best day of our lives (typically! 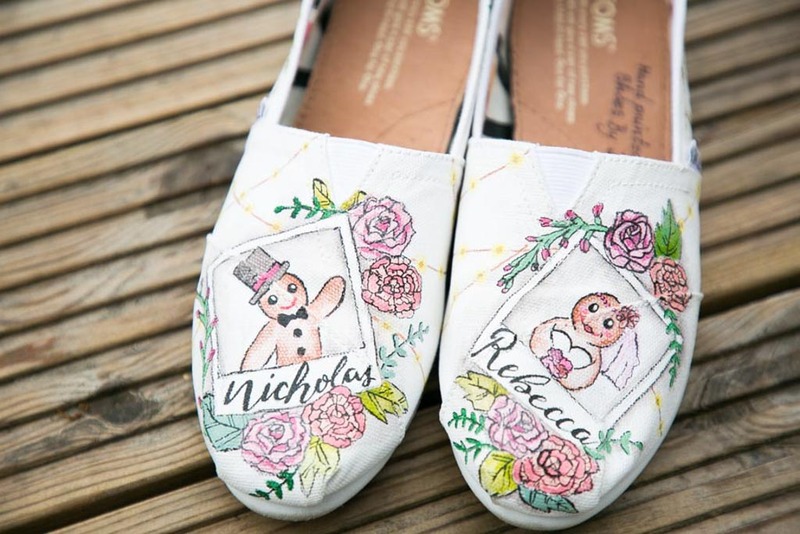 ), and there are no ‘buts’ that follow that what so ever. 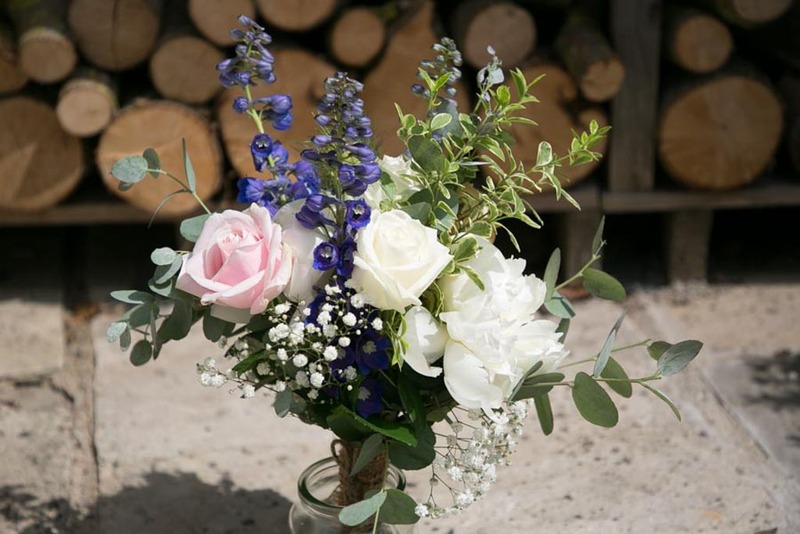 Our advice would be, to be open-minded to all options available as the choices are abundant and to make collaborative choices with each other. 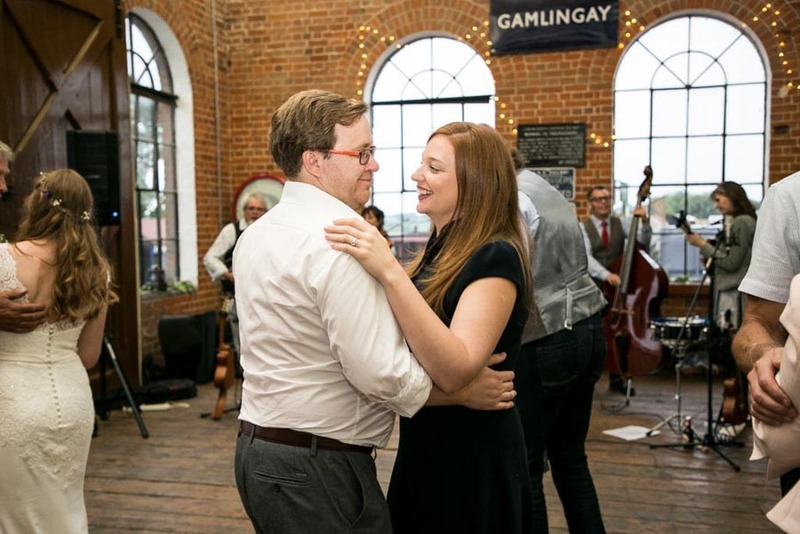 Try to make the day a celebration of who you both are and what you enjoy as a couple. 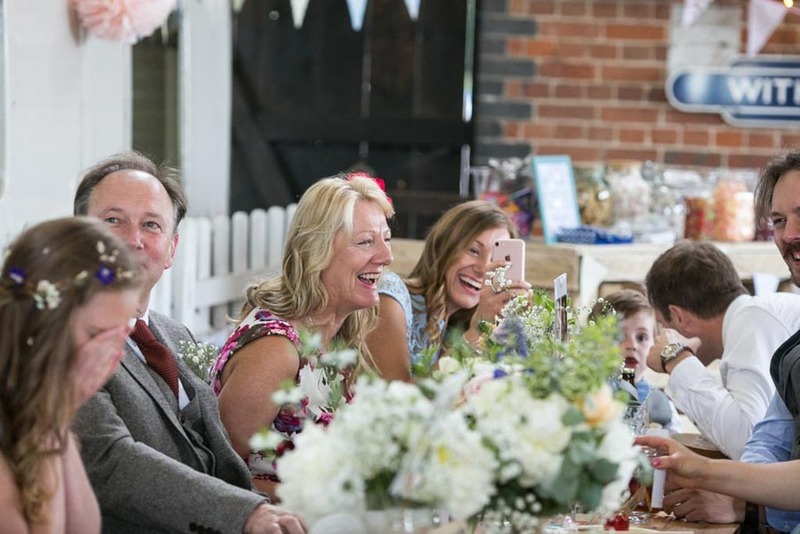 Ultimately just have fun and enjoy every moment and each detail, from the planning, through to the day itself, as it really does all go so quickly! 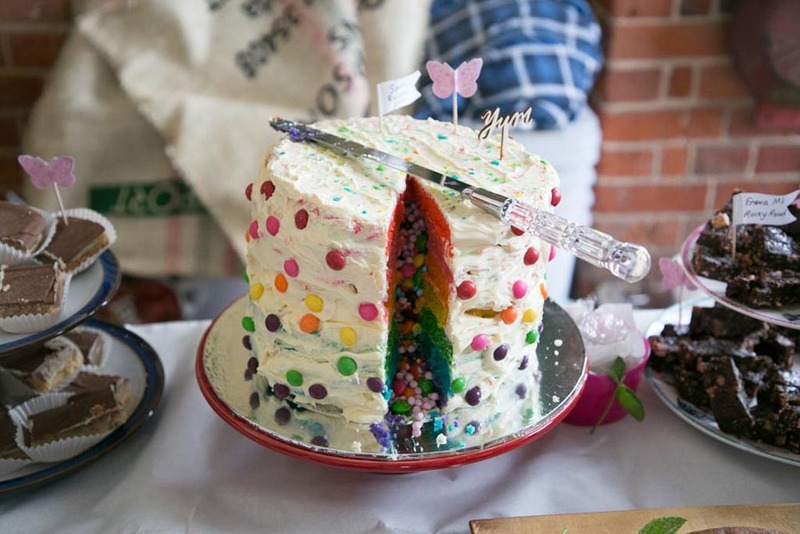 Remember, not to stress, it’s just a big party. 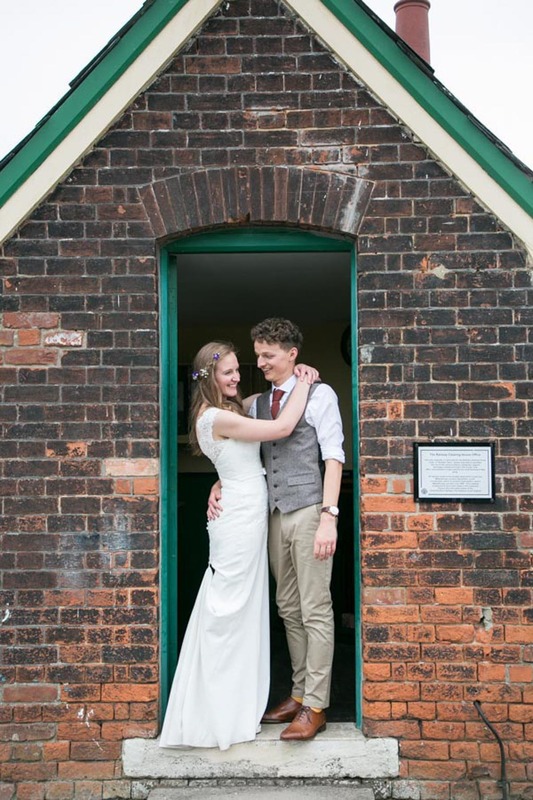 Thank you so much to Rebecca who has captured come gorgeous imagery. 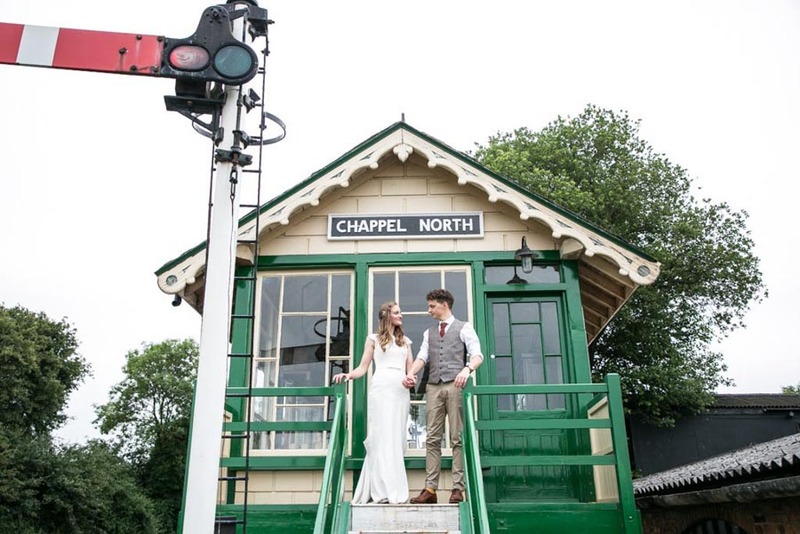 There is something incredibly romantic about the railway, and thoughts go back to days gone by and waving off your love to the War. 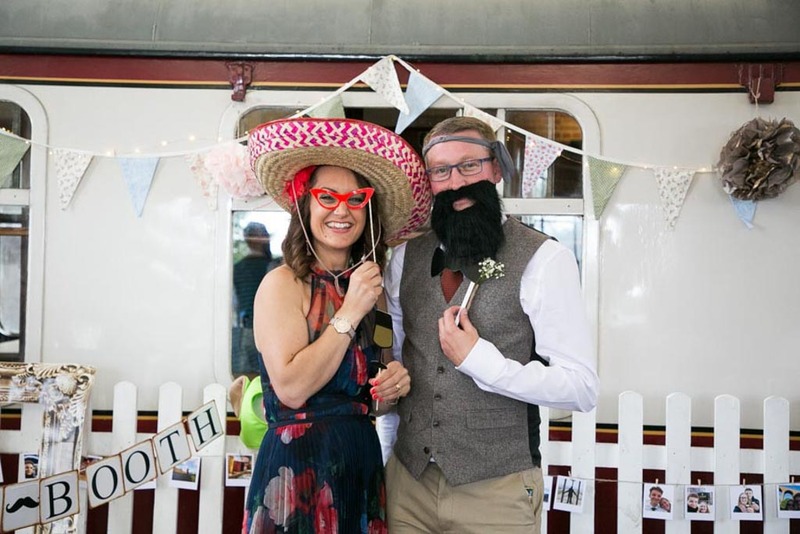 Nick and Becs pulled together a great vintage tea party theme at this incredible wedding setting and look like they had so much fun with it. 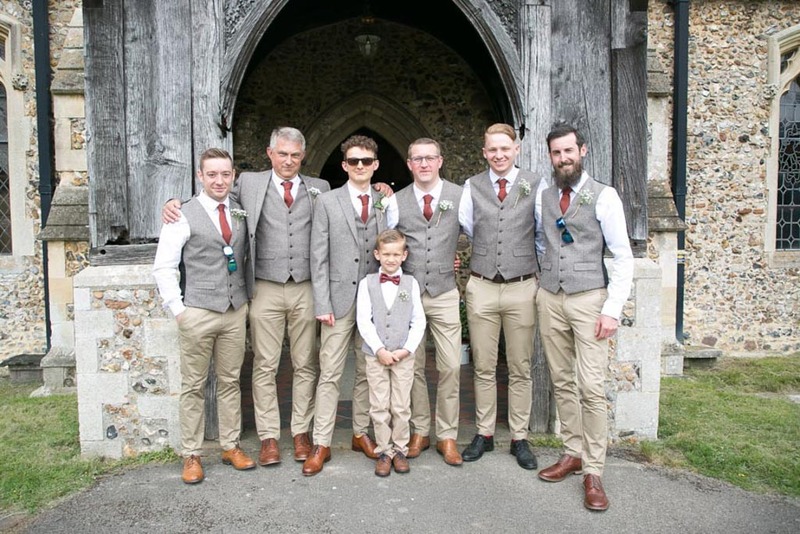 Suits: Mix and match from high street shops, but the ties, waistcoats and jackets were all Next. 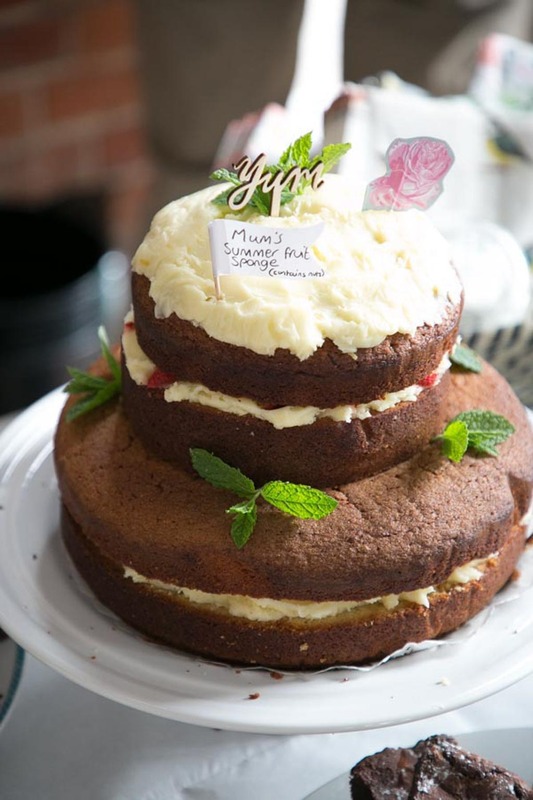 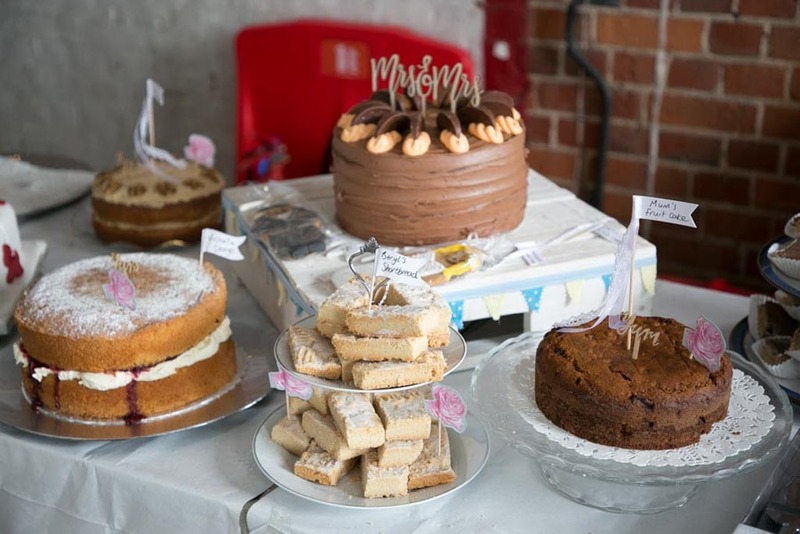 Cake Maker: Most cakes were handmade by family and close friends, but we also ordered a couple of cakes from our local café in Bishop’s Stortford: South Street Pantry – as their chocolate orange cake is amazing! 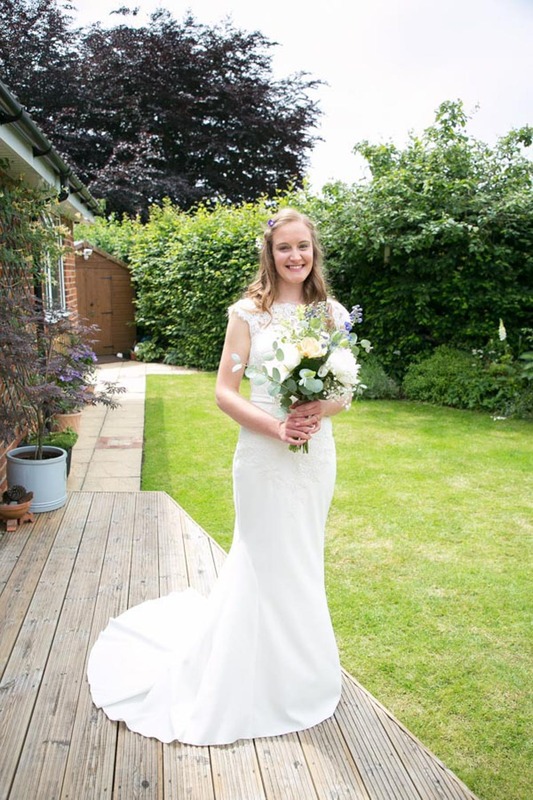 Florist: Nick’s Step Mum – Dawn arranged all the flowers for us. 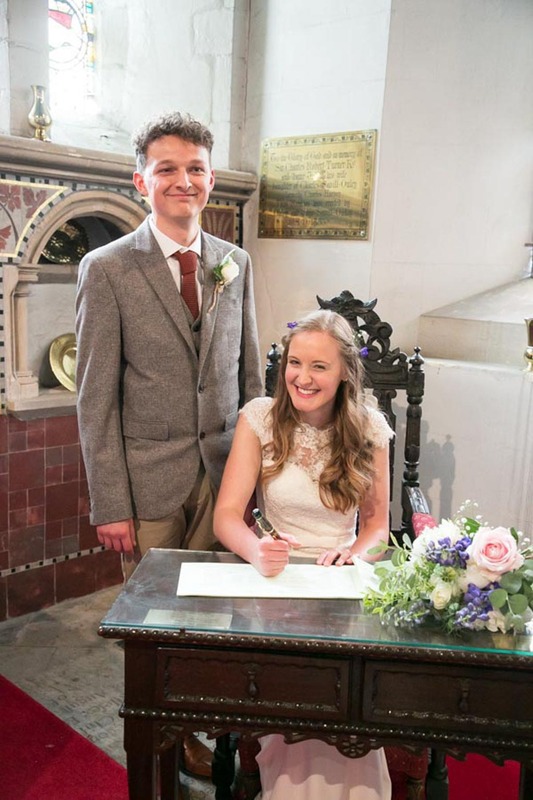 Stationery: We designed and made all our stationery at home. 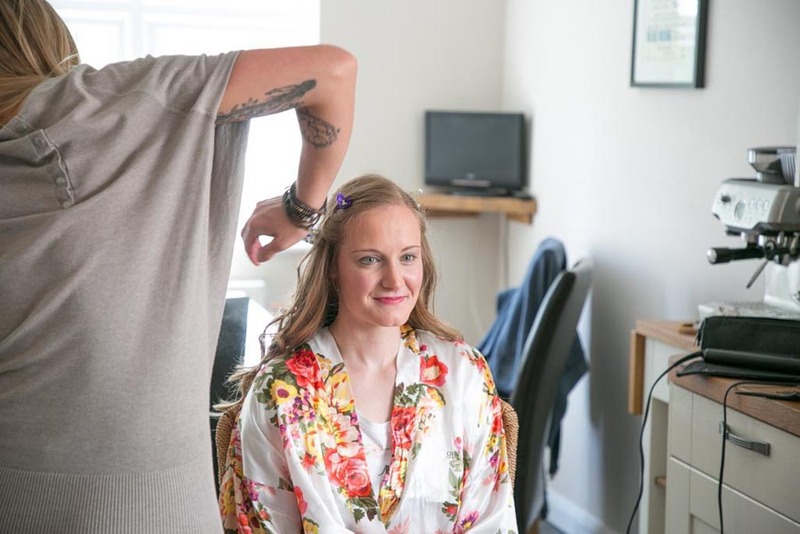 Make up/Hair stylist: Friends and family with special skills helped us out with hair and make-up.